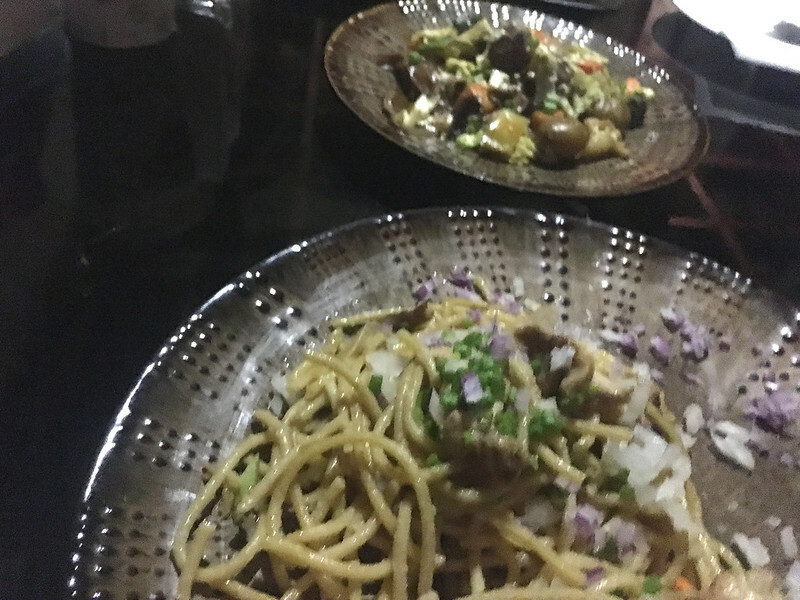 Dining at a roofdeck restaurant affords you a spectacular view to enjoy together with your meal. 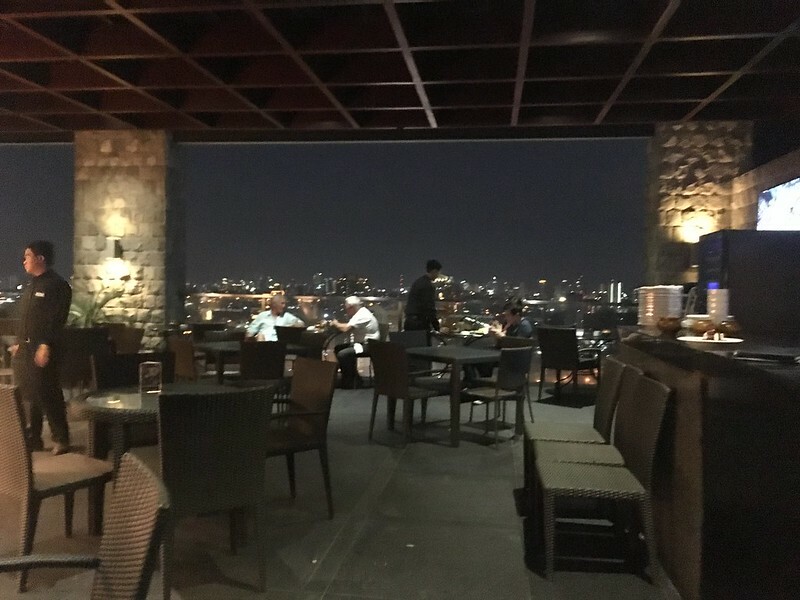 Aside from the stunning vista of city lights, you also get to enjoy cool, clean and calming breezes far removed from the busy streets below. 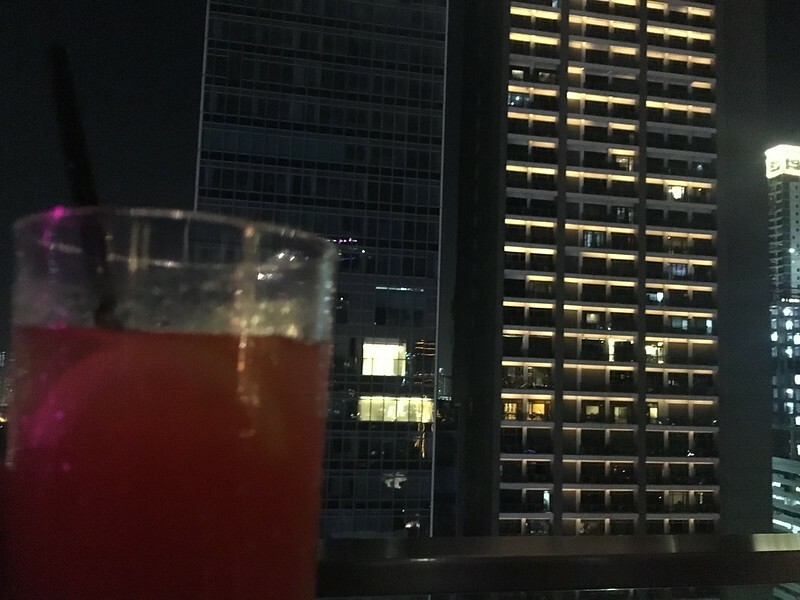 Despite my acrophobia, I have a special affinity for roofdecks: I guess the peace and relaxation I experience when situated far above my normal concerns outweigh my chronic fear of heights. 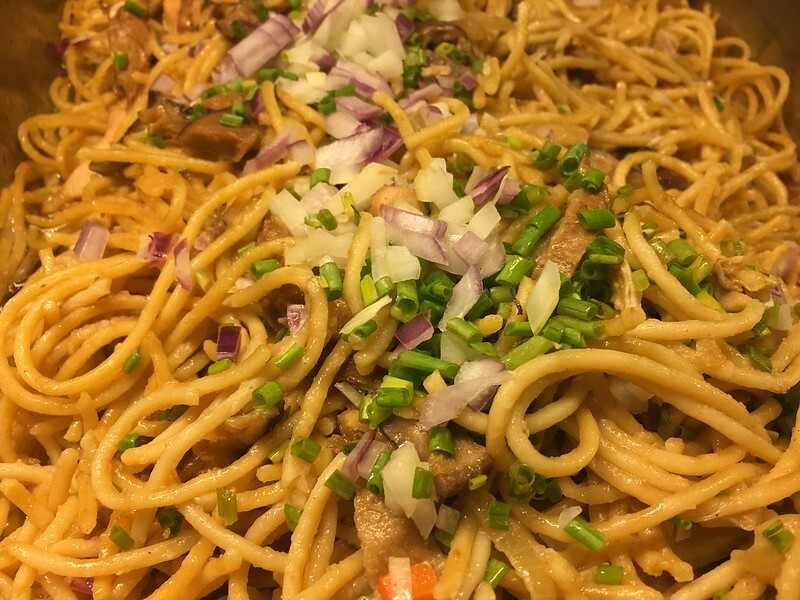 This is why I was excited when Zomato invited me to a foodie meetup at Firefly Roofdeck. 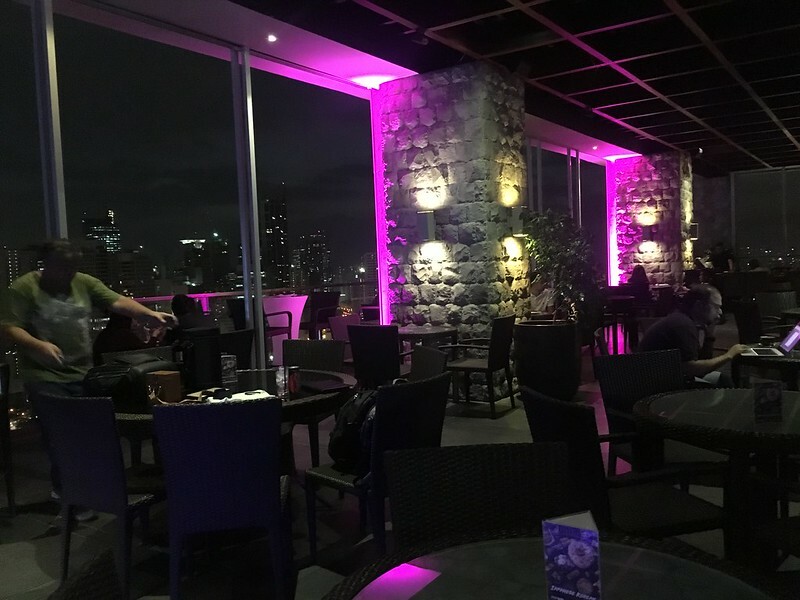 Located at the 32nd Floor of City Garden Grand Hotel in Makati, Firefly Roofdeck provides a chill ambiance in which you can relax and while away the workday’s stresses. 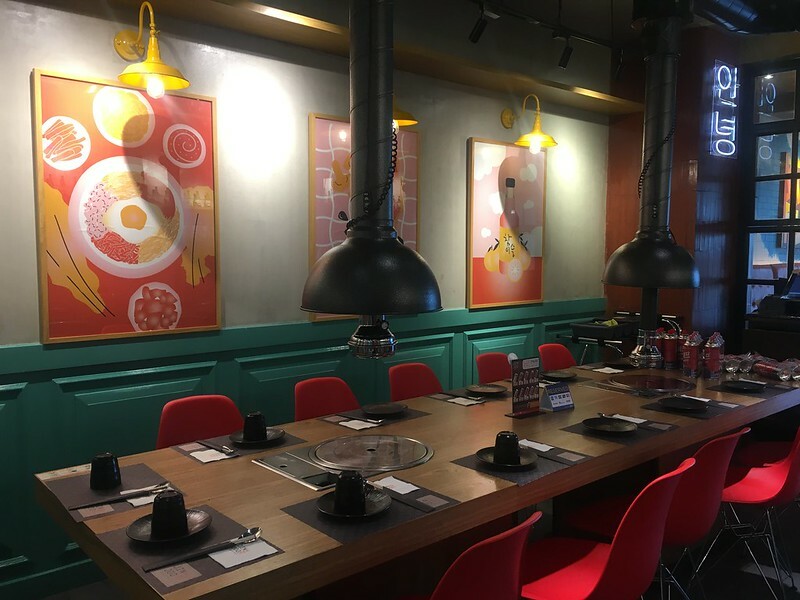 The resto’s ceilings, spacious dining area and al fresco setup give you an expansive background for your get-together with friends or solo chill-out drinks while waiting for Makati rush hour traffic jams to abate. 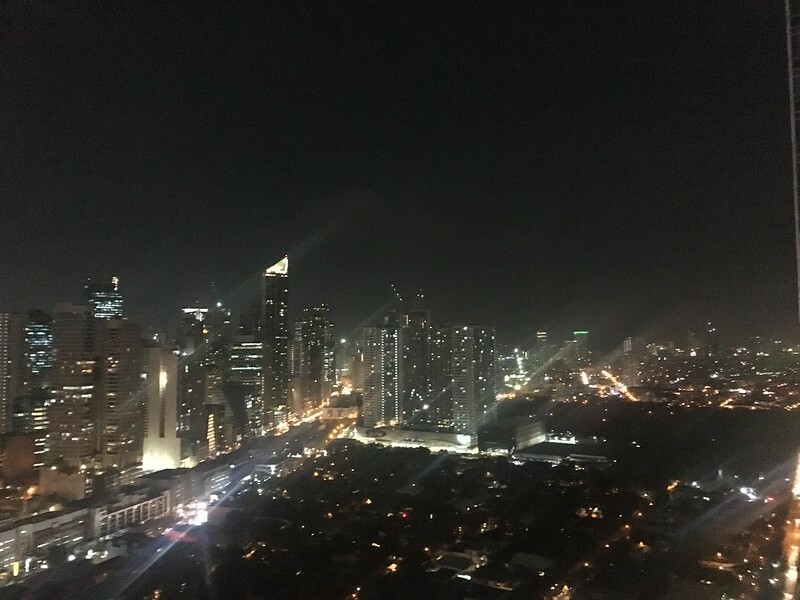 Firefly Roofdeck’s view of the Makati skyline is quite simply breath-taking. 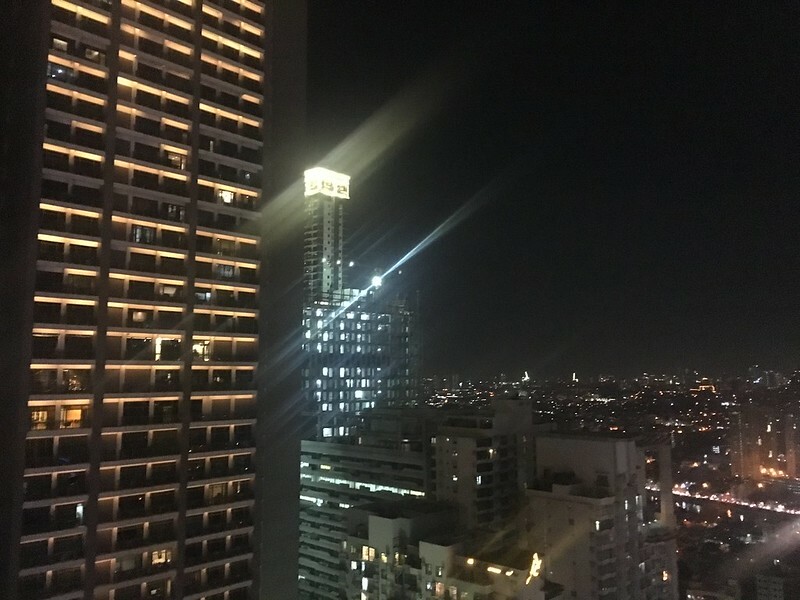 Especially during evenings, you will see a wide expanse of blue-black sky awashed with pin-points of colorful lights and skyscrapers jutting upward. 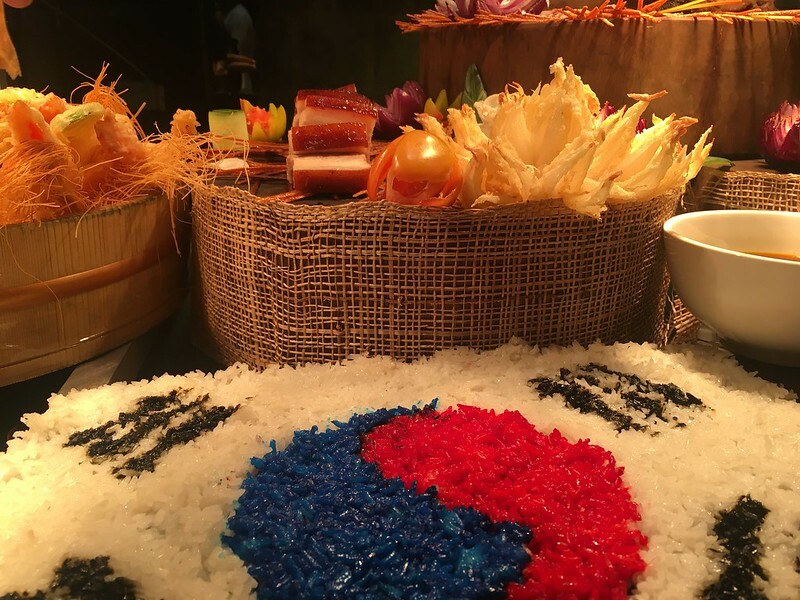 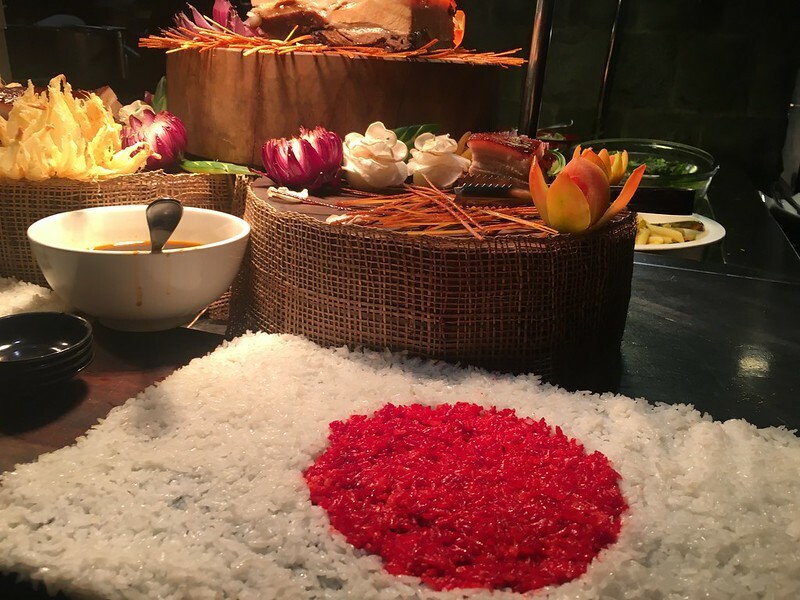 Firefly Roofdeck recently launched its Japanese-Korean buffet, coincidentally, two of my favorite cuisines. 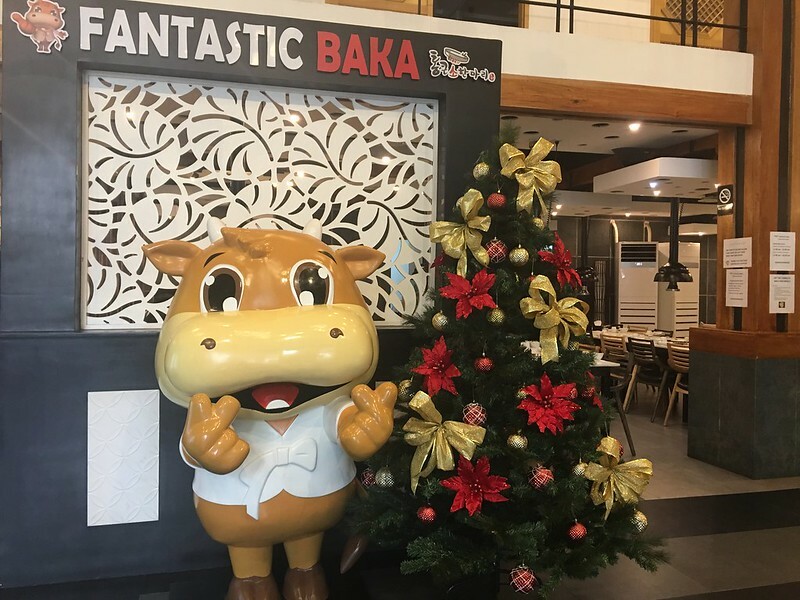 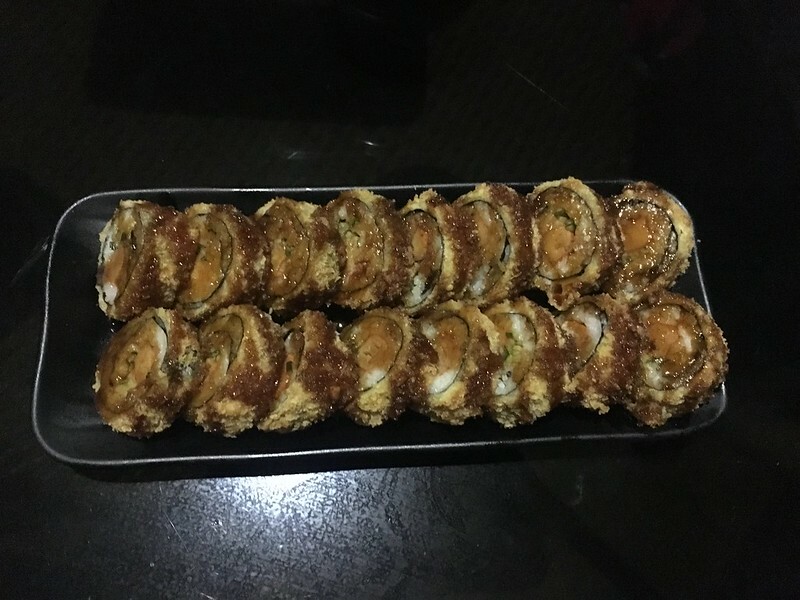 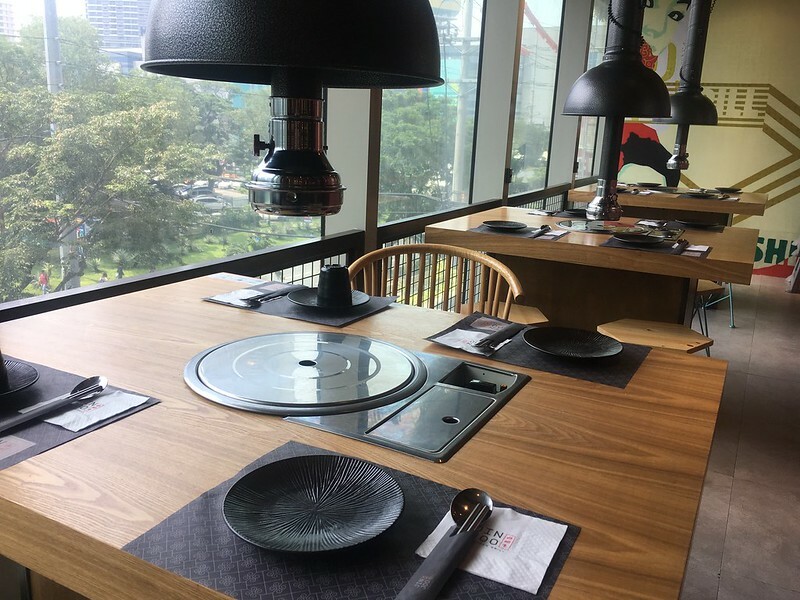 It boasts of an extensive menu of new and favorite Japanese and Korean dishes, giving diners a wide selection of viands to choose from. 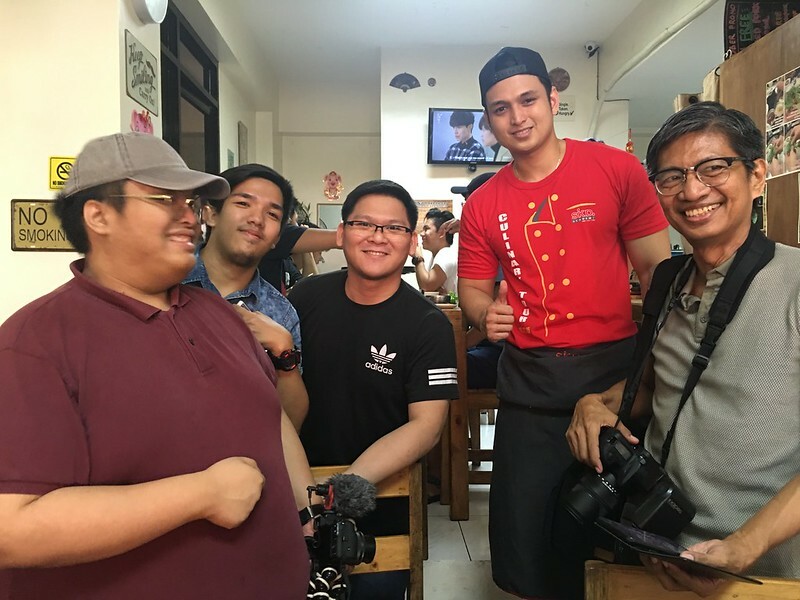 At only Php800+ per person, it is available only for dinner until November 30, 2018. 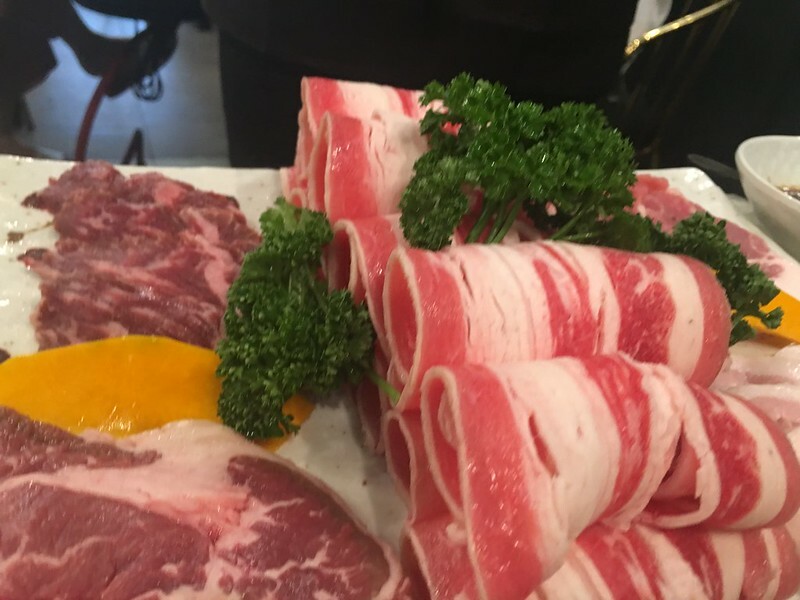 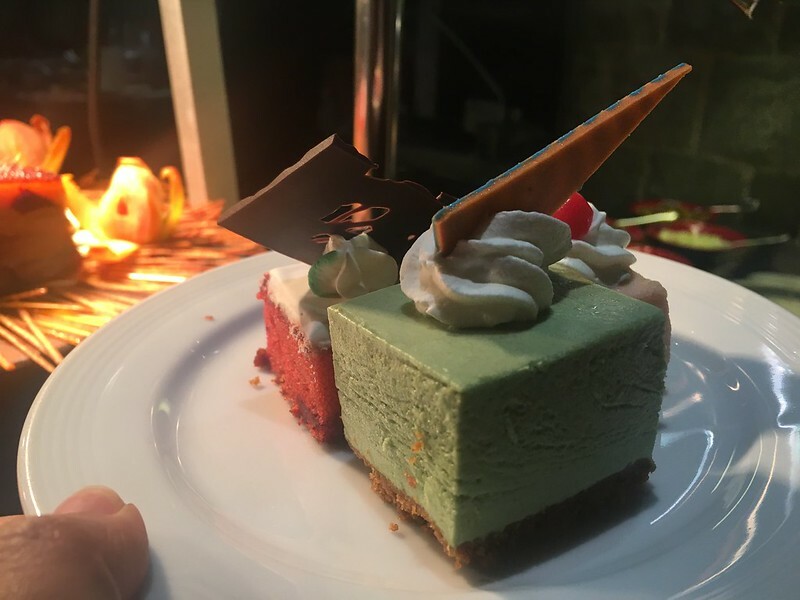 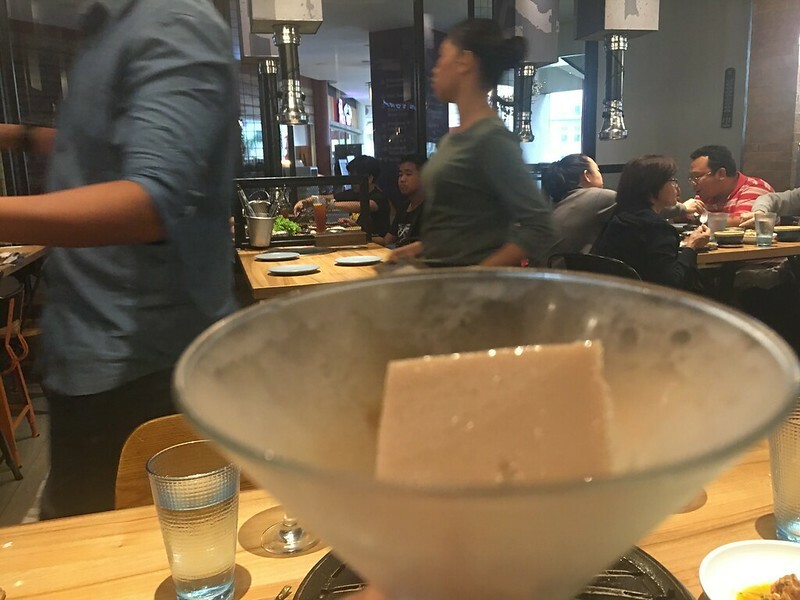 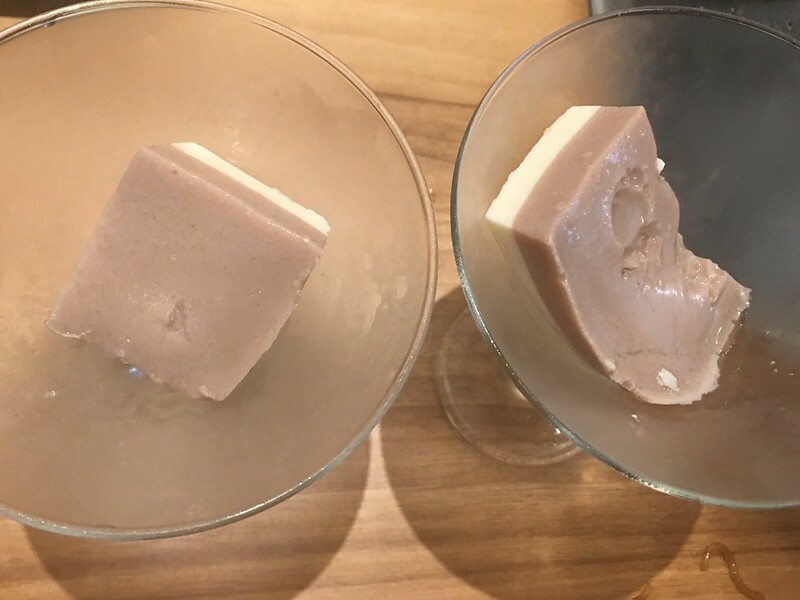 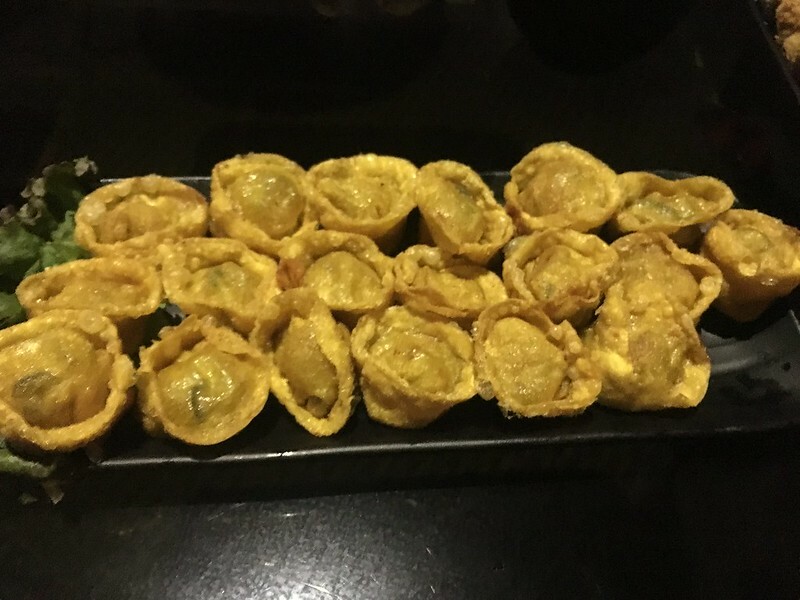 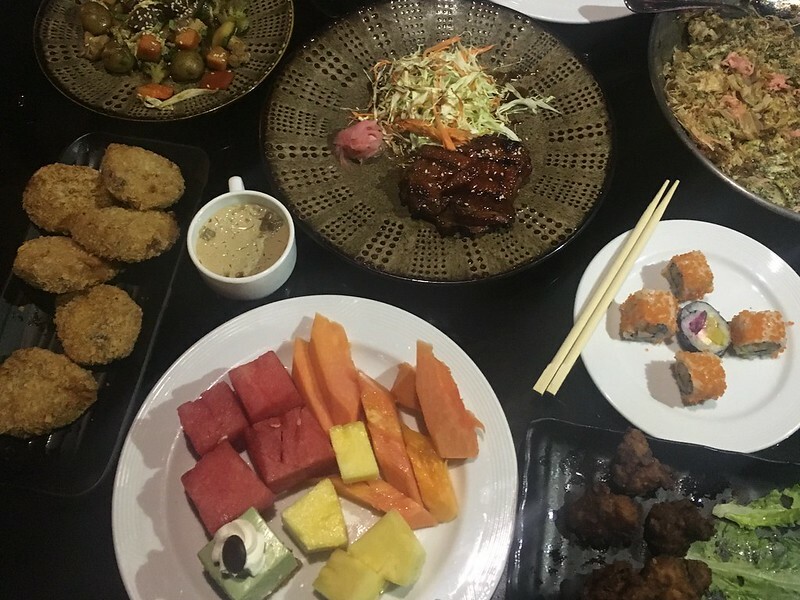 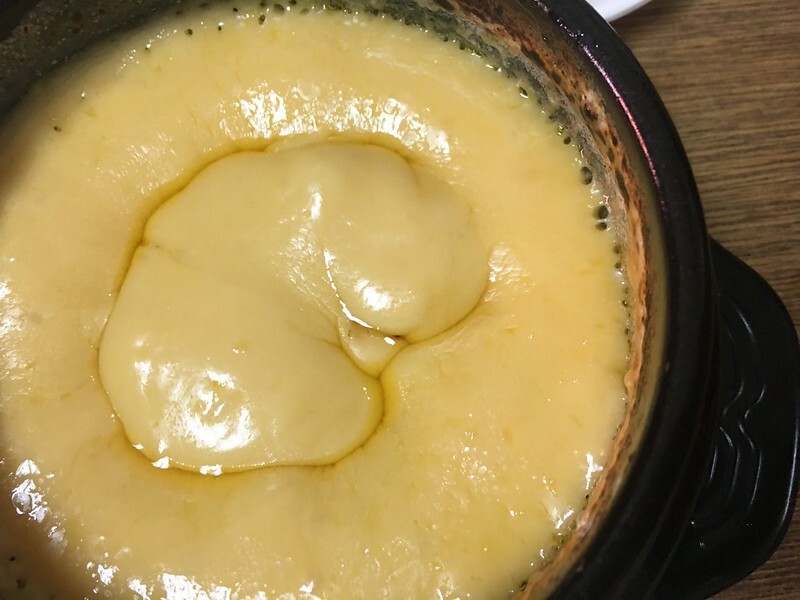 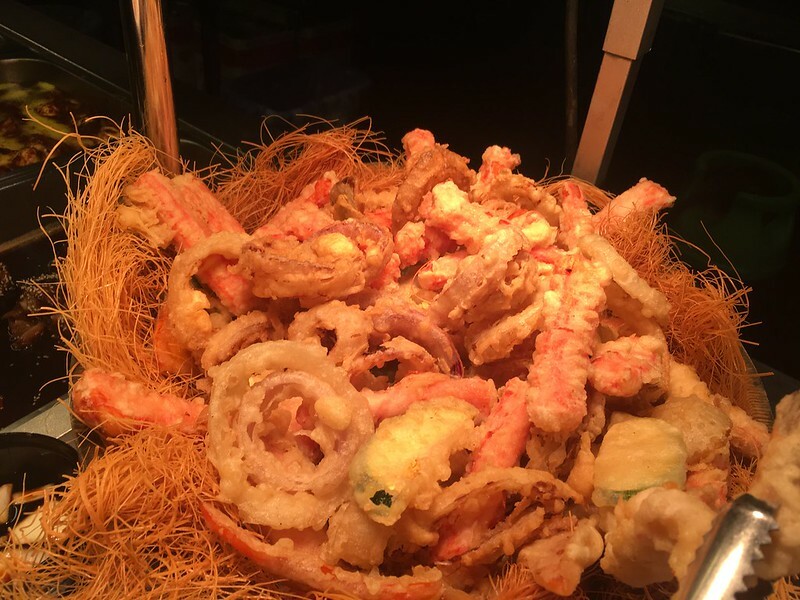 The sheer variety of food on offer can be quite overwhelming at first, but as I’ve often advised when eating at an eat all-you-can buffet, concentrate on food that are your absolute faves or try out ones you don’t get to eat often. 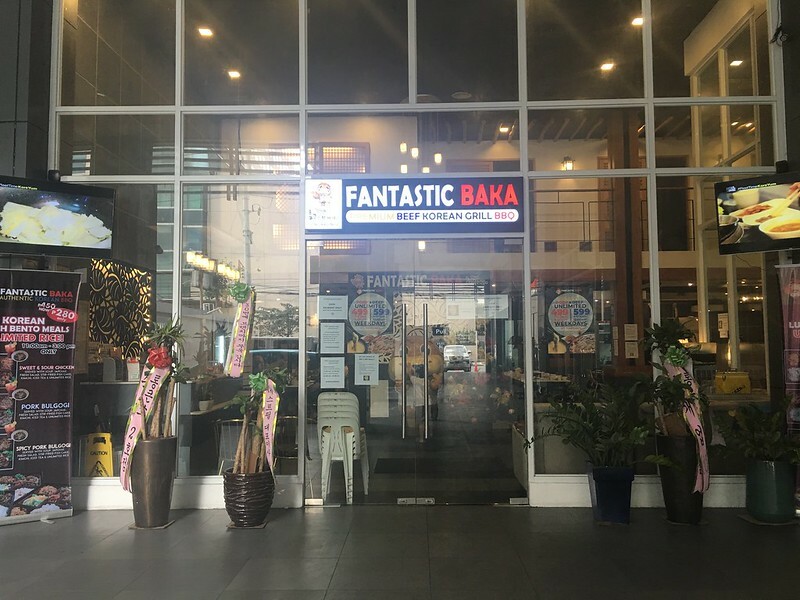 This way, you get to maximize your savings and the experience. 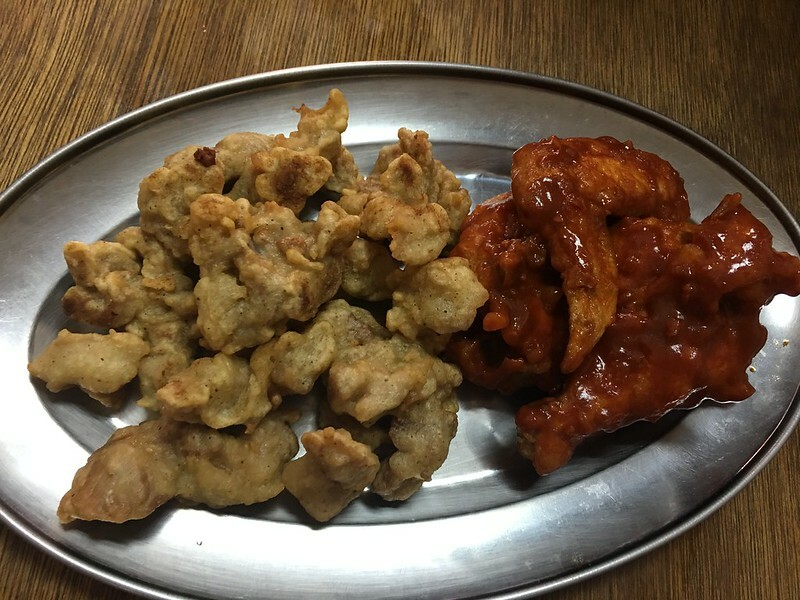 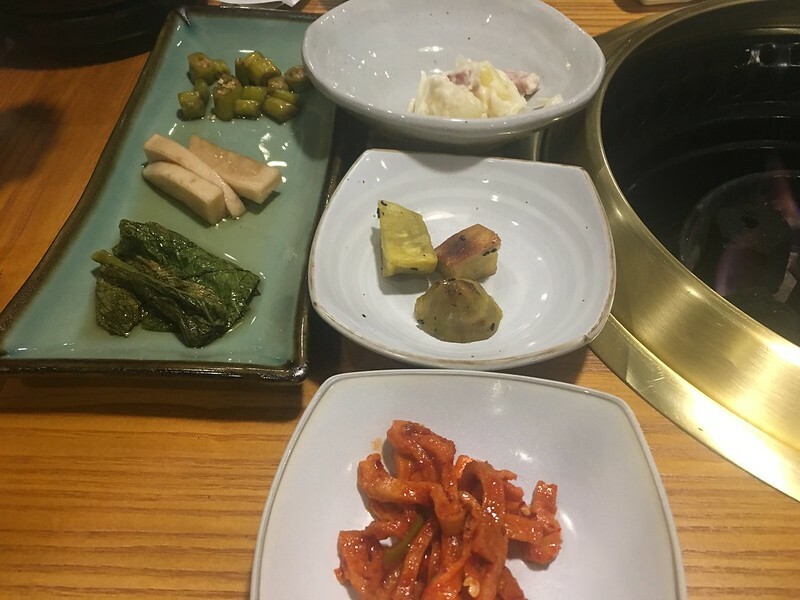 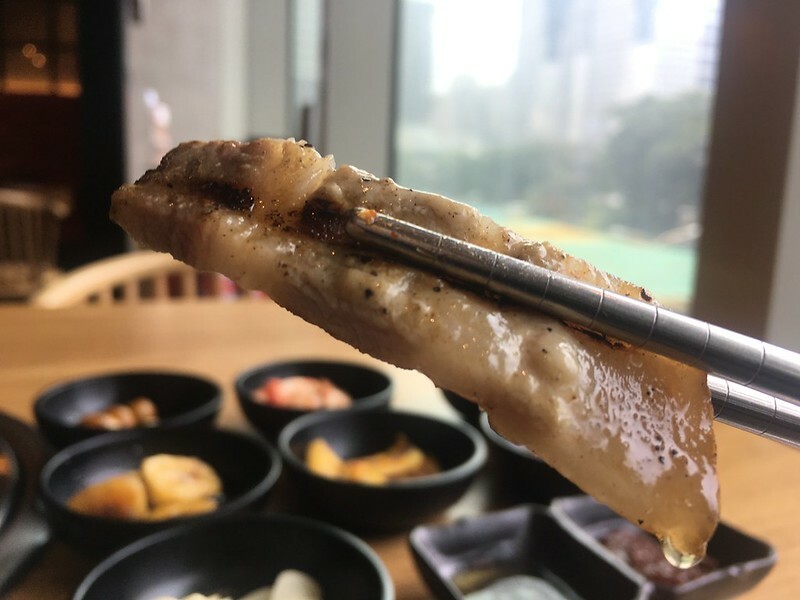 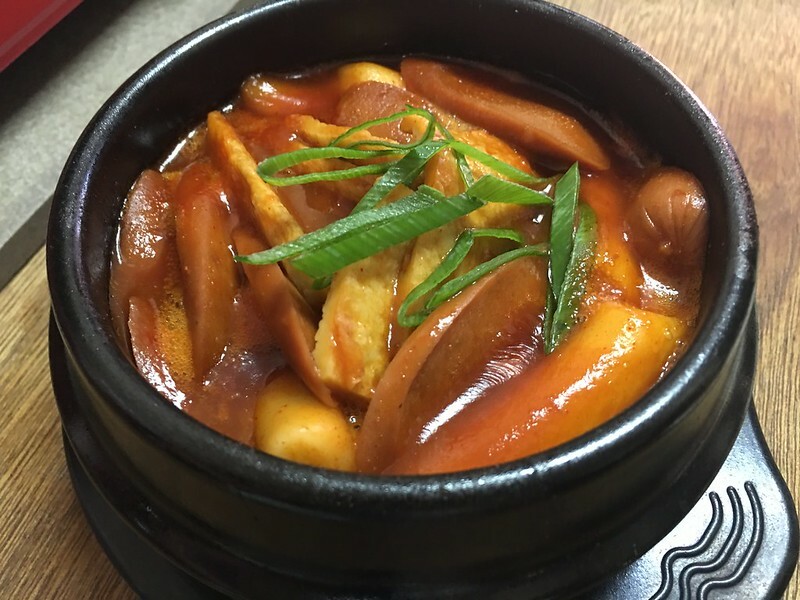 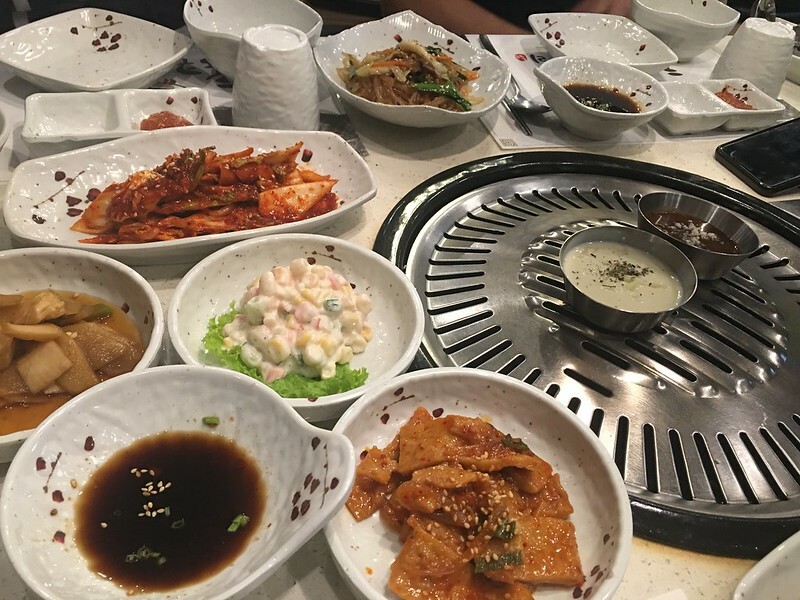 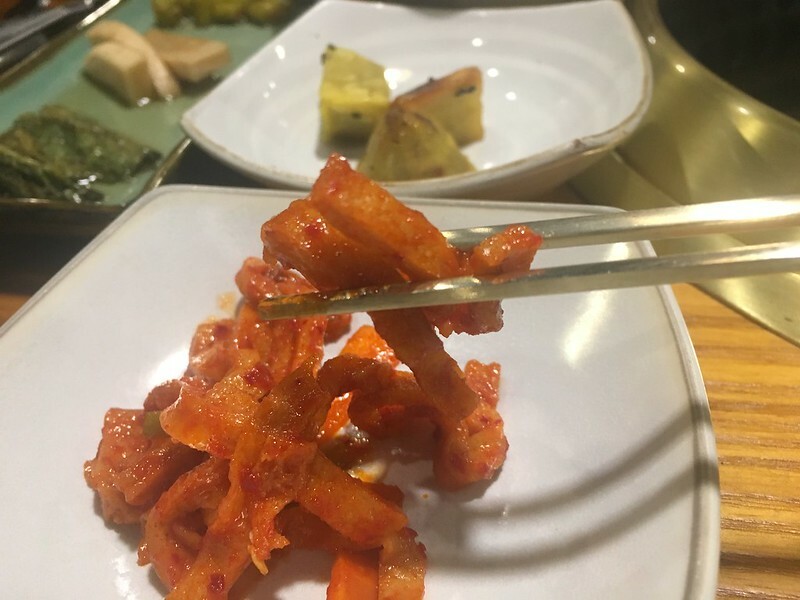 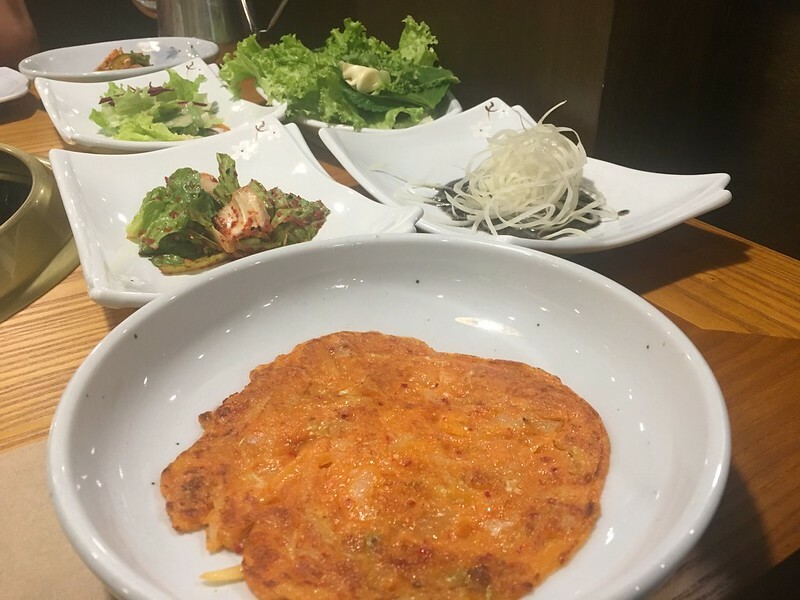 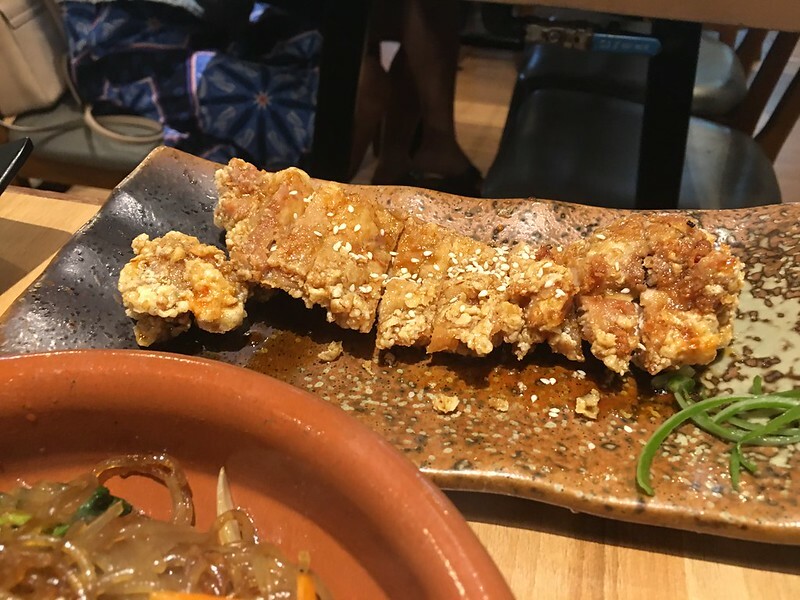 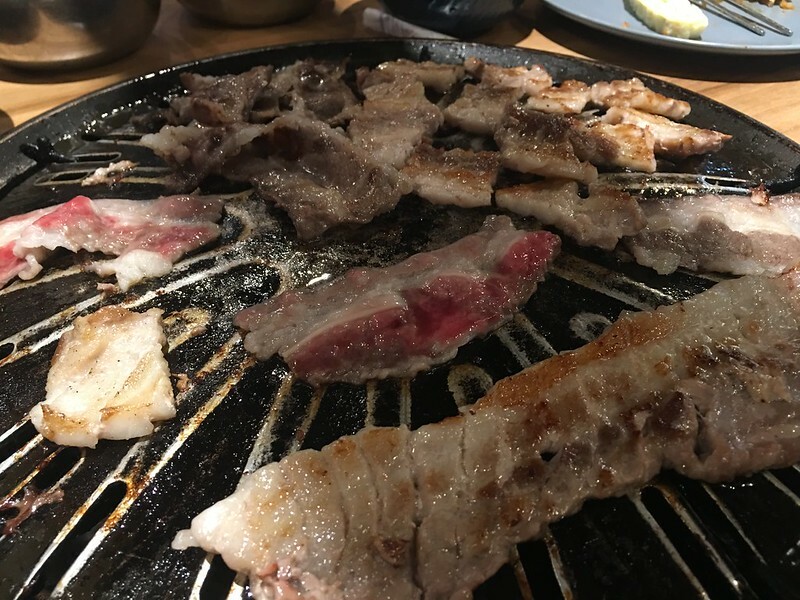 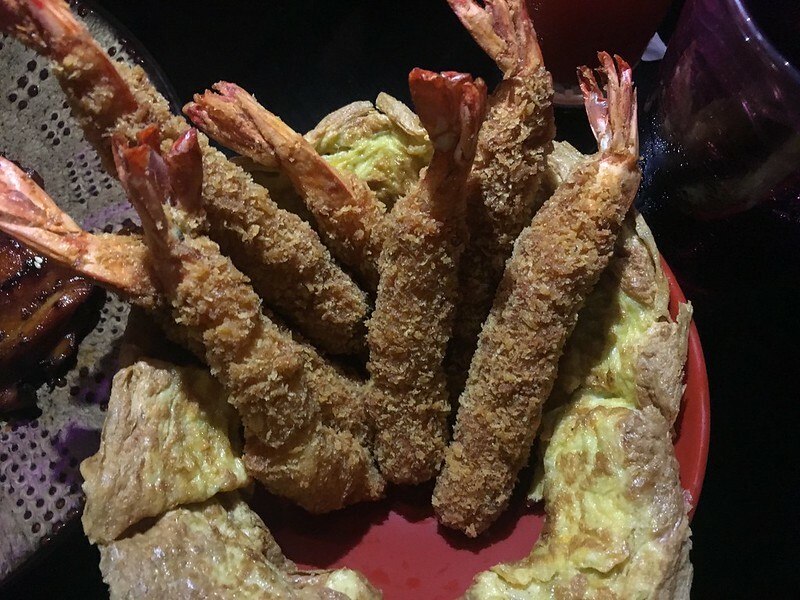 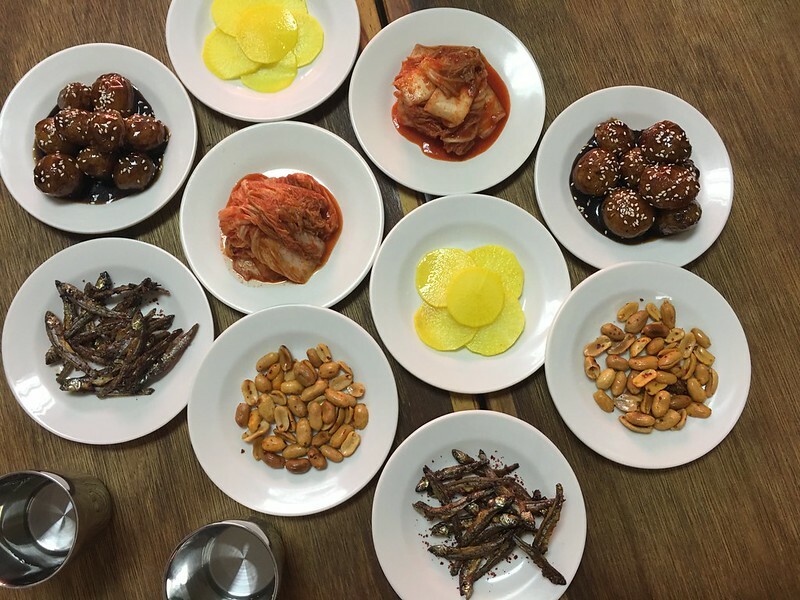 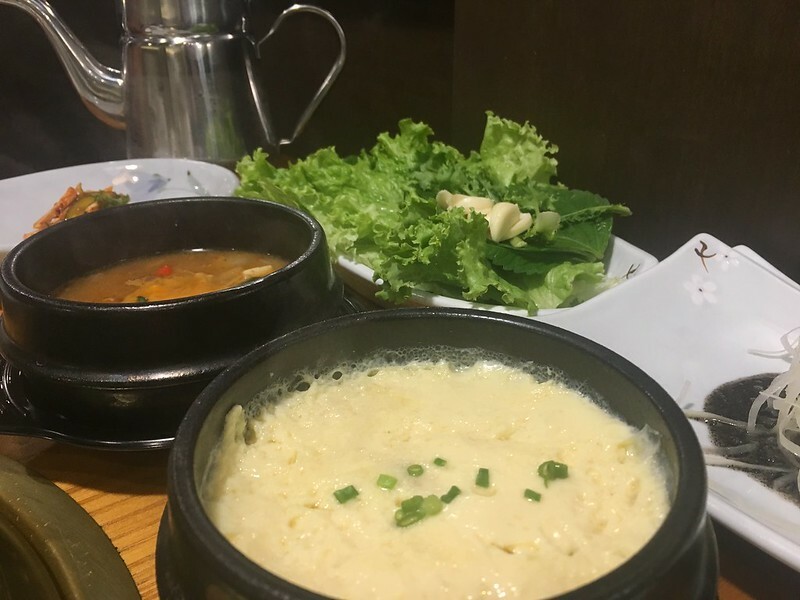 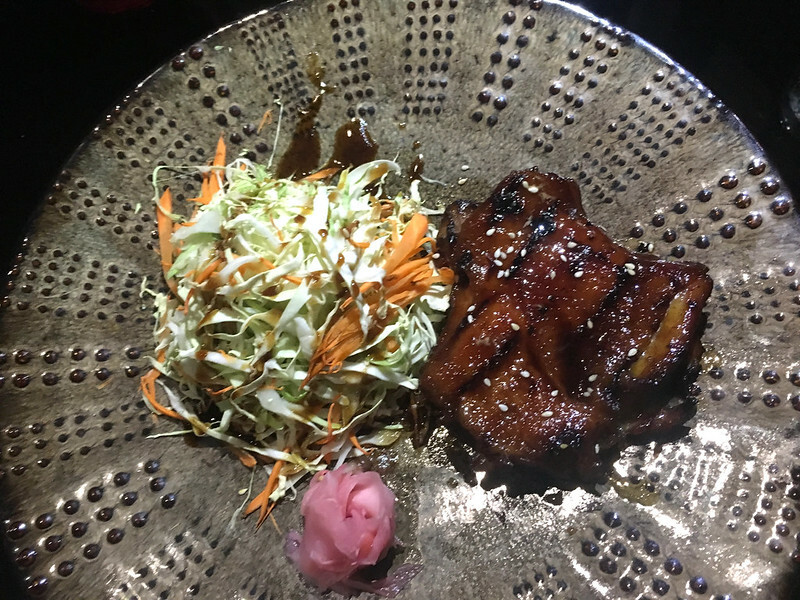 Some menu items could use a few tweaks such as offering mild and spicy ssamjang dipping sauces to go with the grilled pork and chicken, replenishing the ebi tempura more often, offering more dessert choices (hopefully bingsu!) 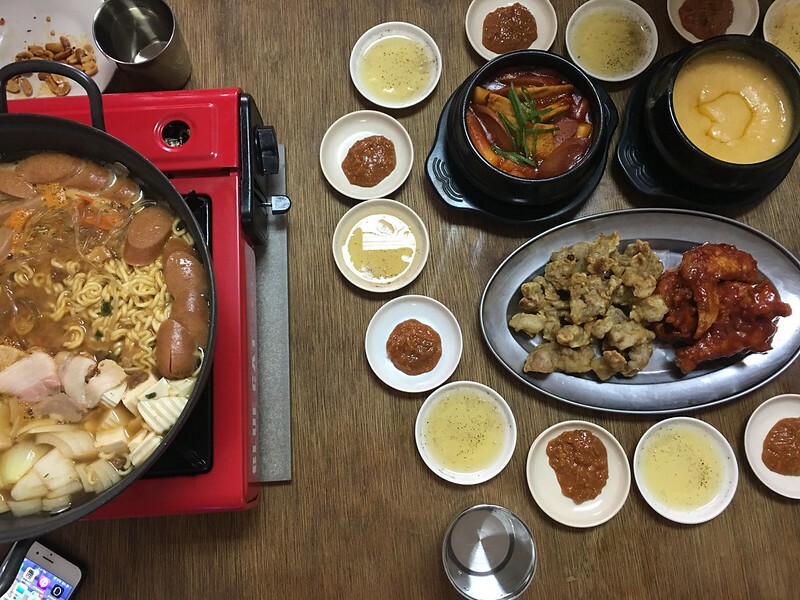 and lessening the sweetness of the teokbokki. 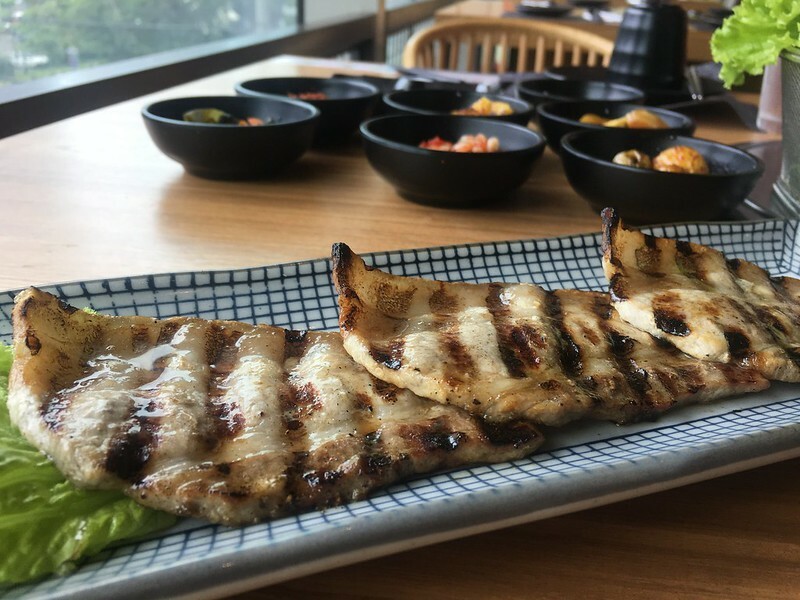 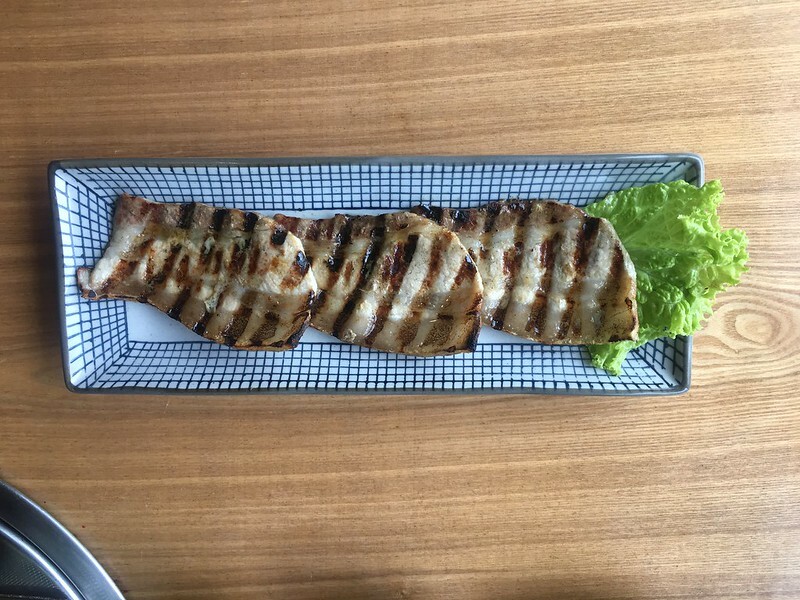 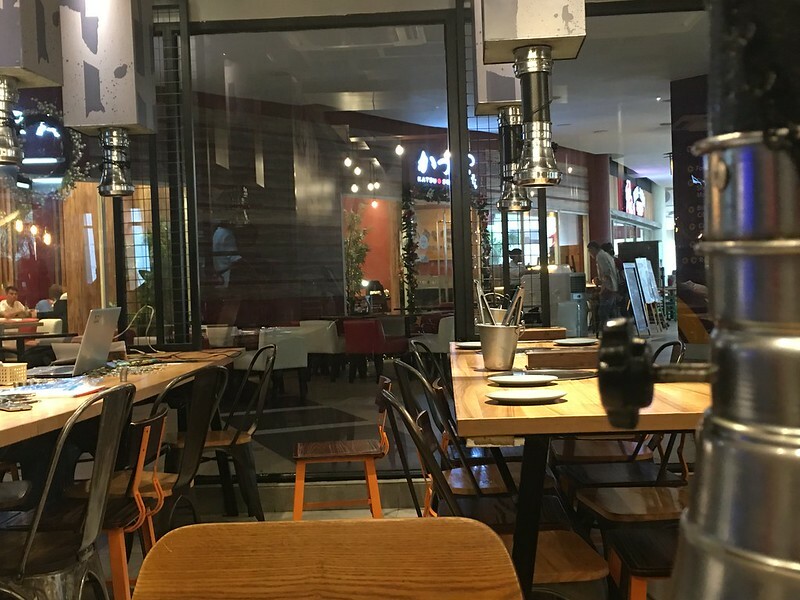 Other than those points for improvement, the upscale ambiance and the superb servicing of Firefly Roofdeck’s wait staff make dining at Firefly Roofdeck truly memorable. 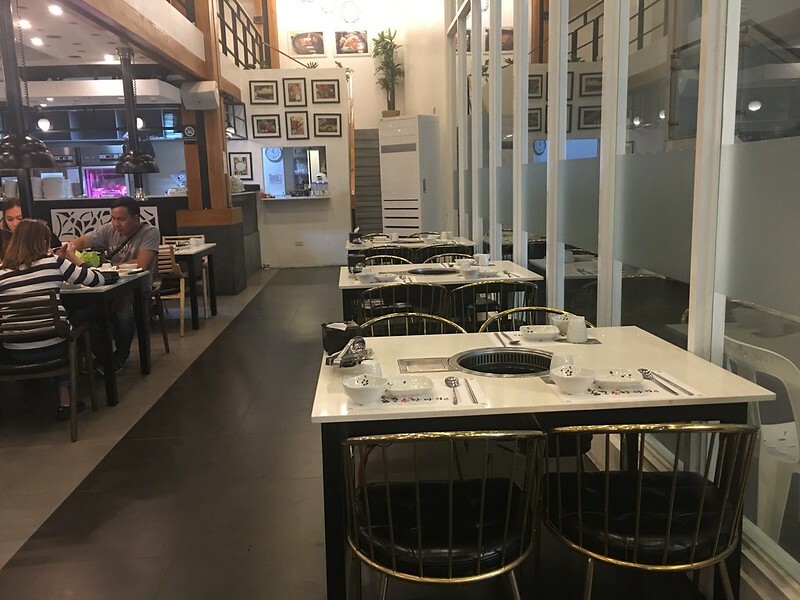 Firefly Roofdeck is located at the 32nd Floor of the City Garden Grand Hotel, Makati Avenue corner Kalayaan Avenue, Poblacion, Makati City, open daily from 10am to 2am. 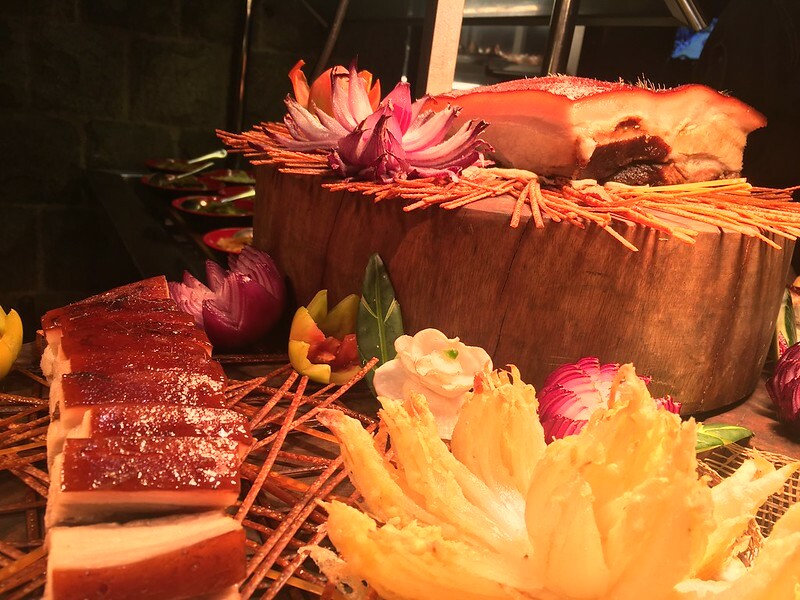 For reservations and inquiries, call +63 2 5543429. 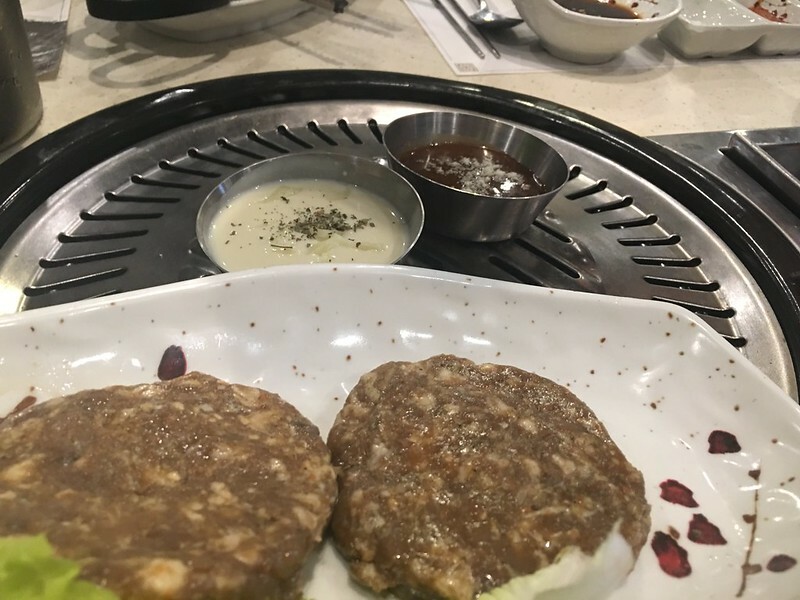 I’ve been hearing a lot about Jin Joo Korean Grill and I’ve been hankering to try it out. 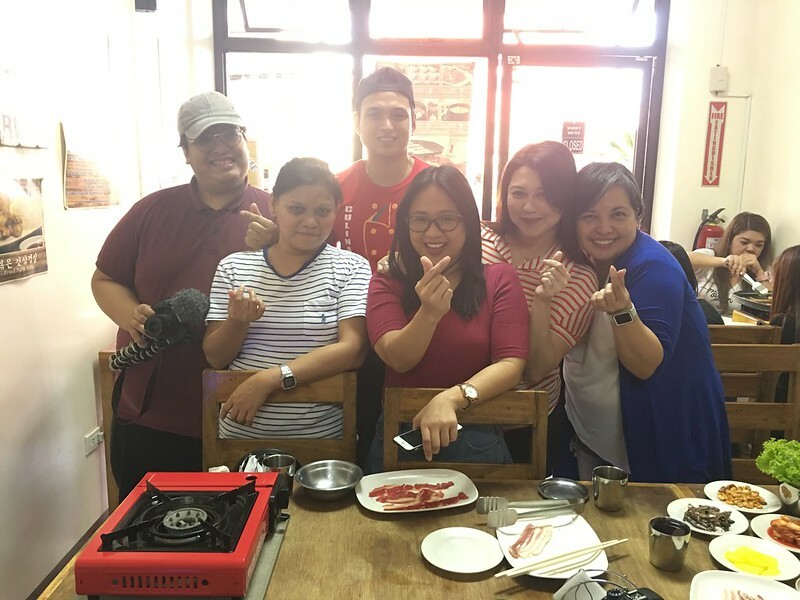 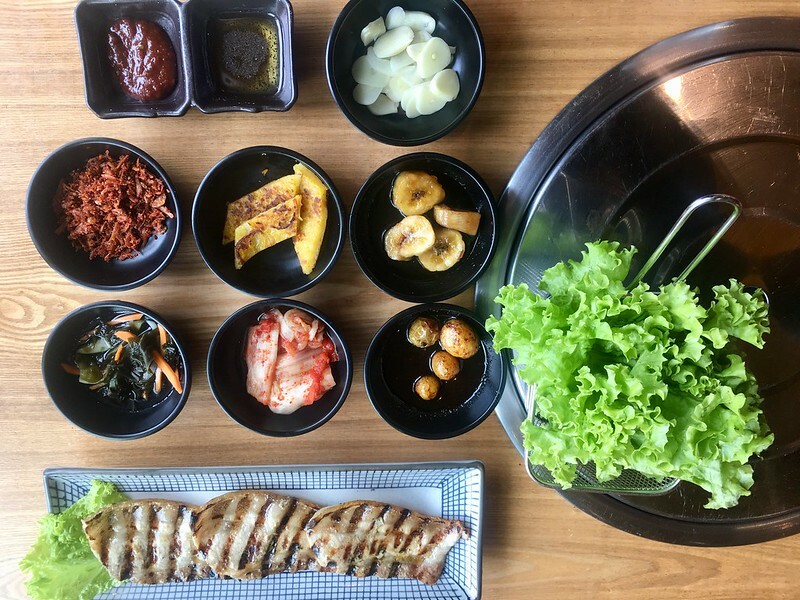 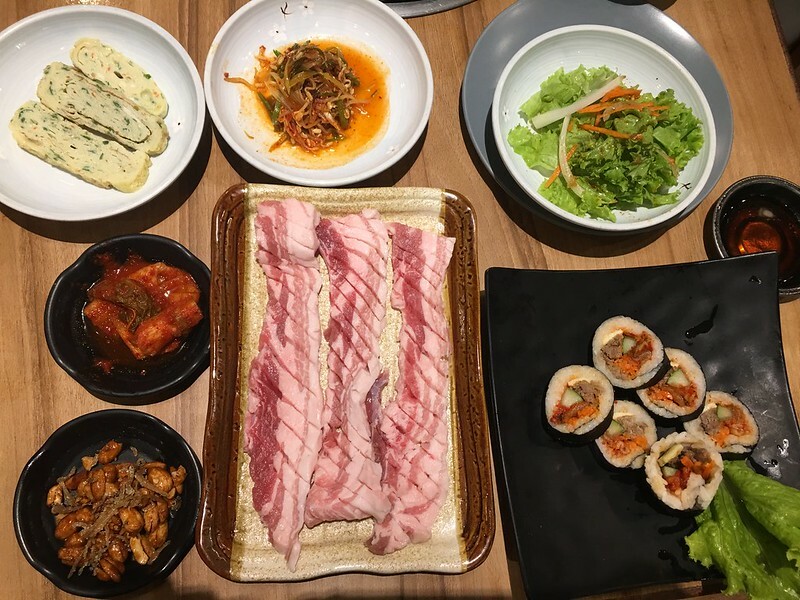 When I saw a Metrodeal offer that would allow me to enjoy its Samgyeopsal Grill with unlimited side dishes, normally priced at Php470, at the discounted price of only Php149, I just grabbed it and scheduled my Korean food adventure. 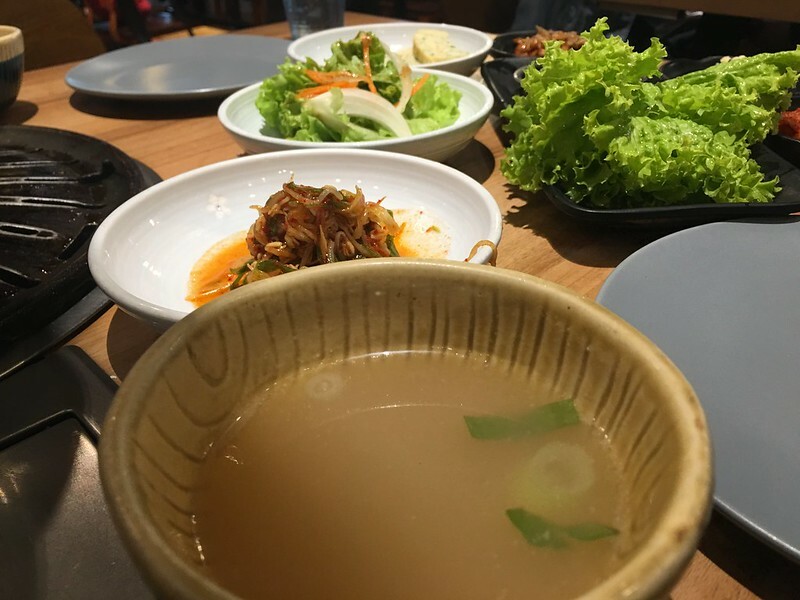 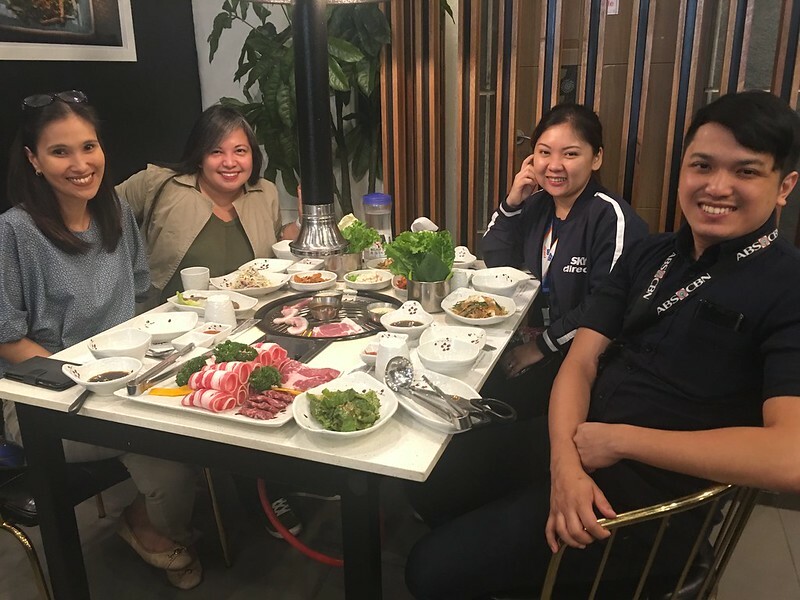 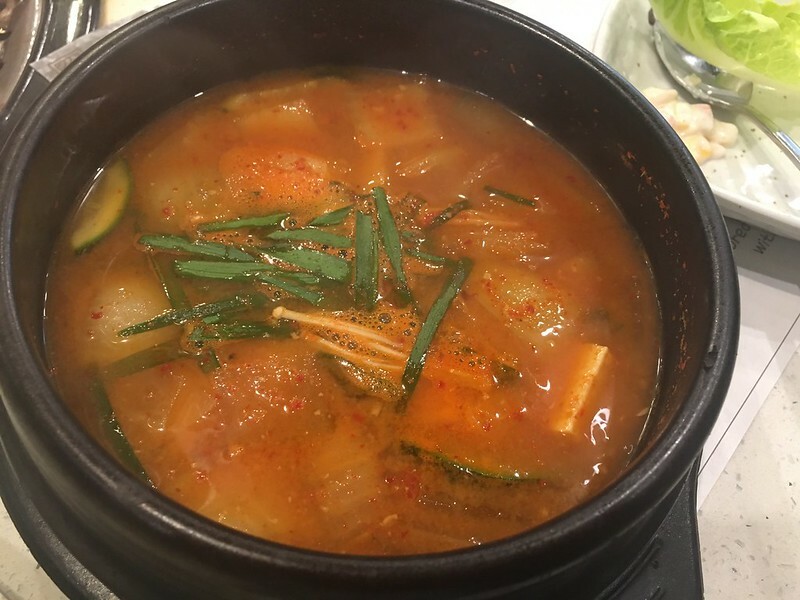 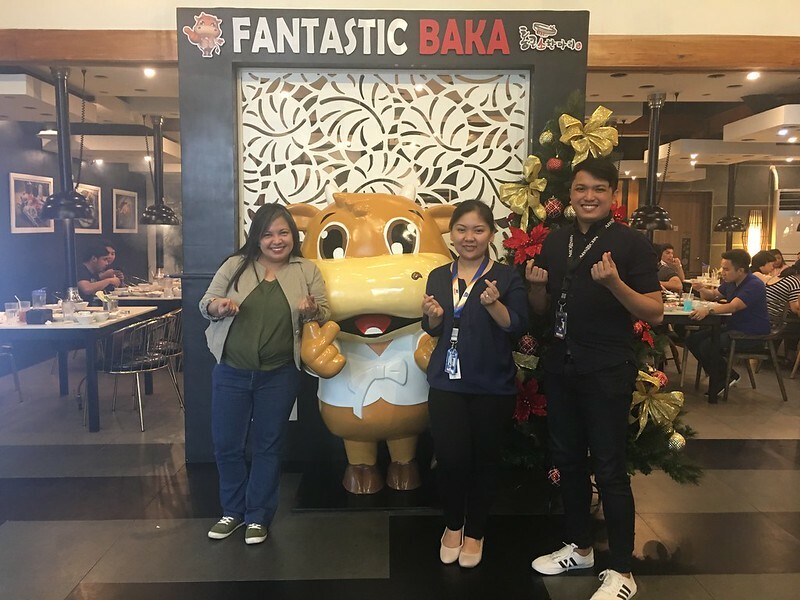 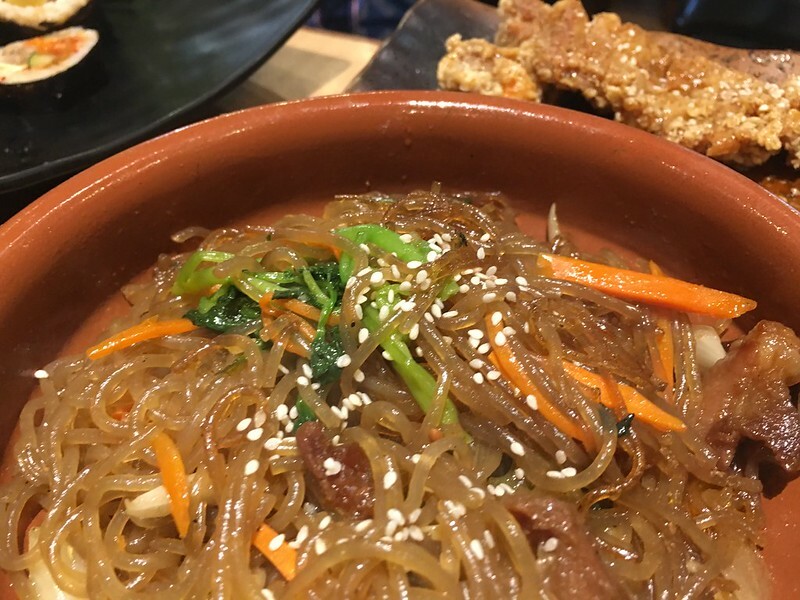 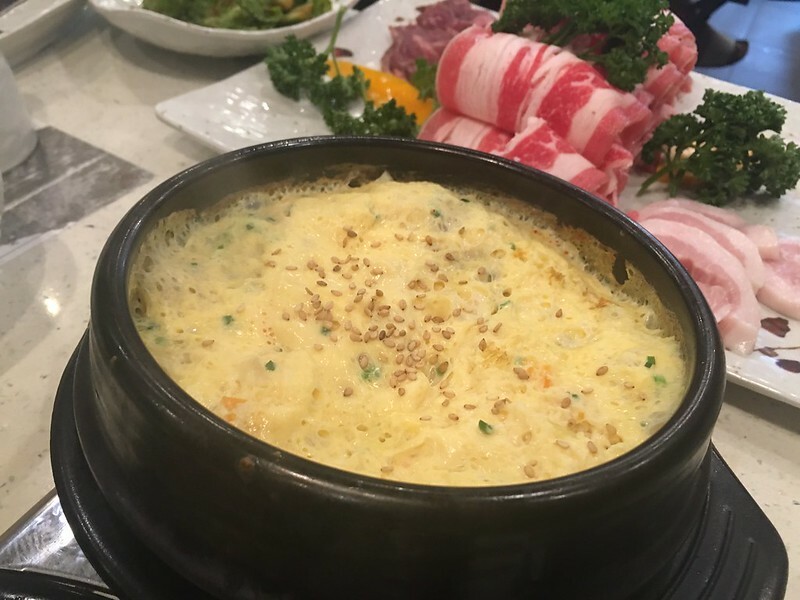 This also gave me a reason to visit the newly renovated The Podium mall in Ortigas Center, wherein Jin Joo is one of the welcome additions to the mall’s gustatory offerings. 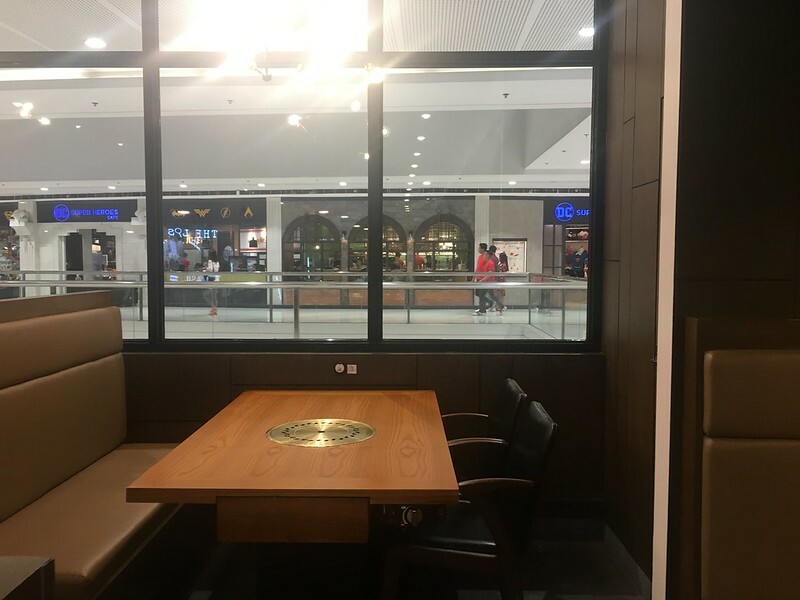 Located at the mall’s second floor, its facade first appeared cramped. 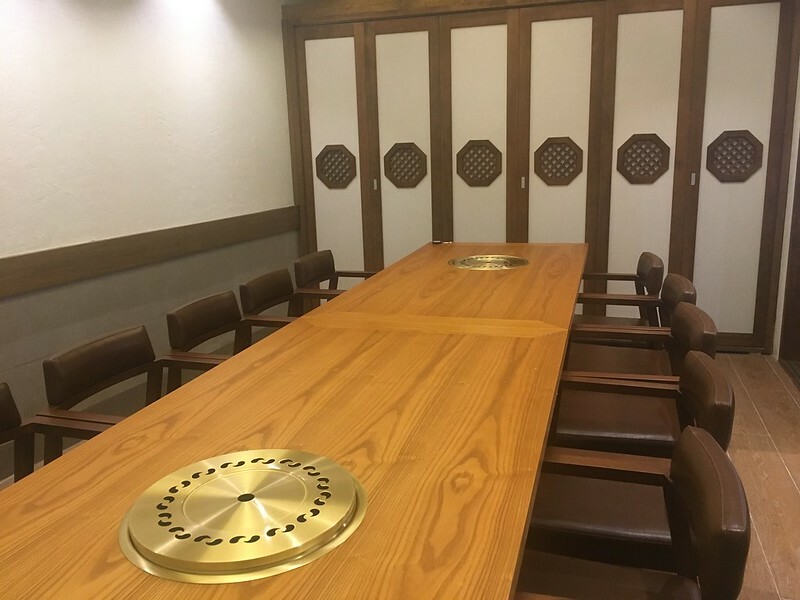 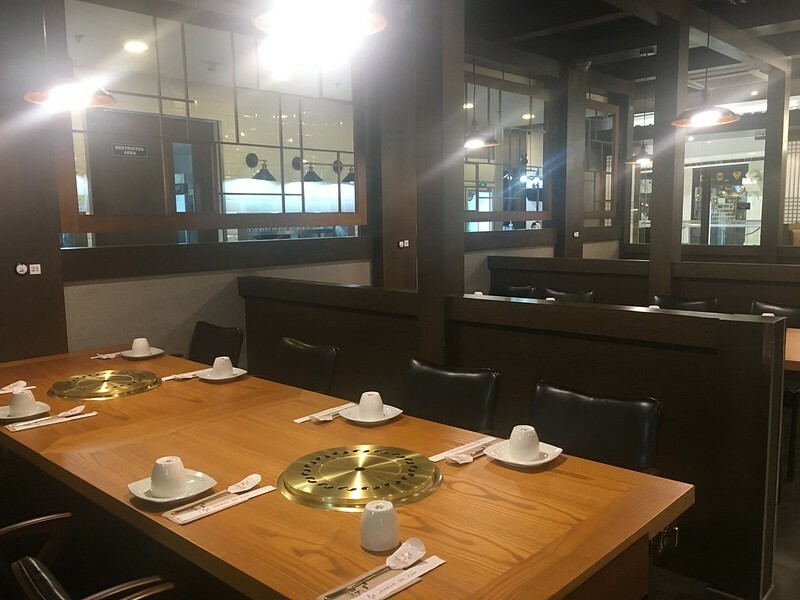 However, I changed this opinion upon entering: it has a sprawling and well-appointed dining area, comprised mostly of wood elements. 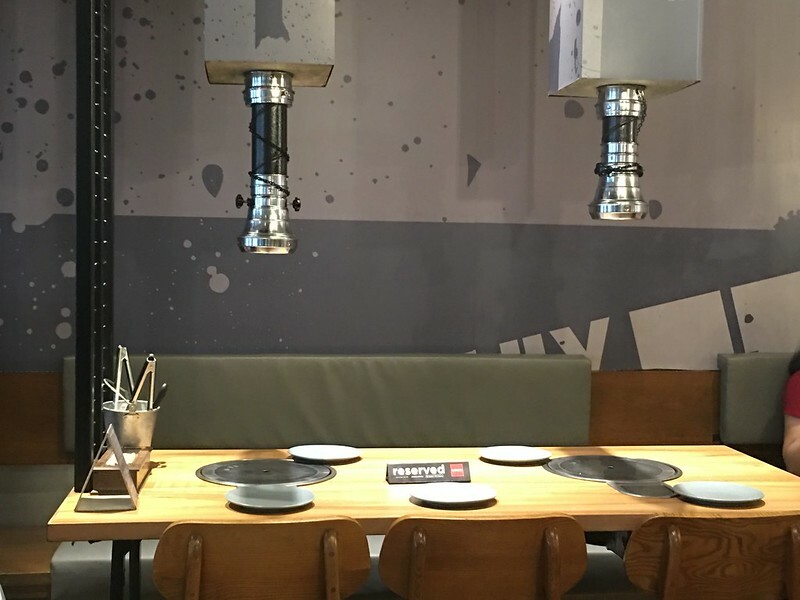 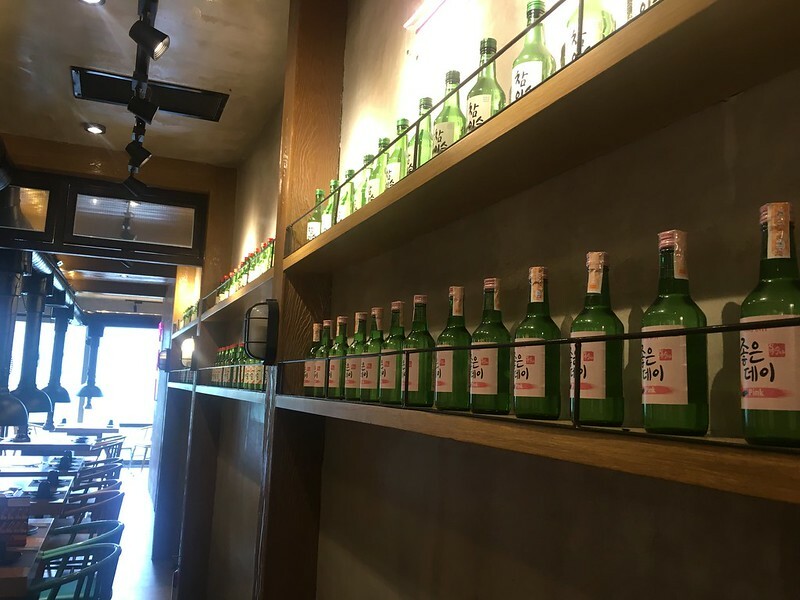 Here and there are spots of interest like colorful Asian-themed paintings on the wall, tasteful lighted signages and linesmof soju bottles along another wall. 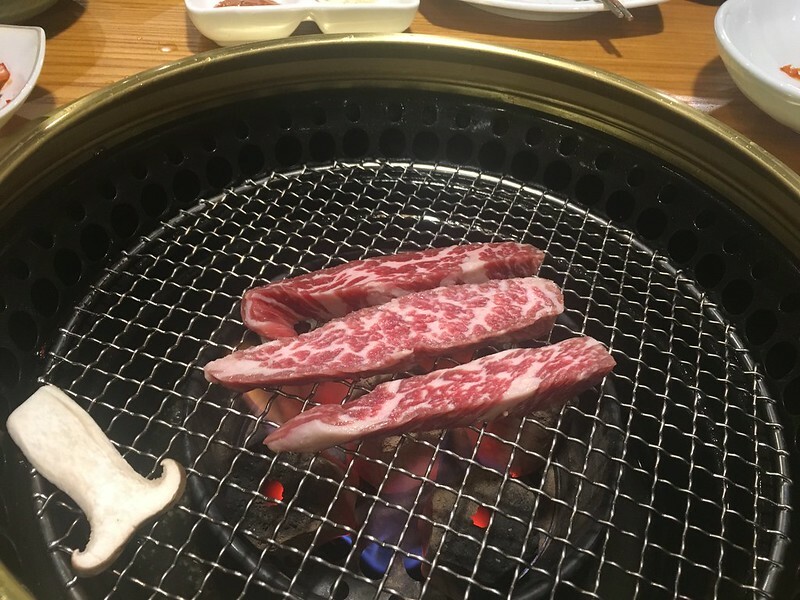 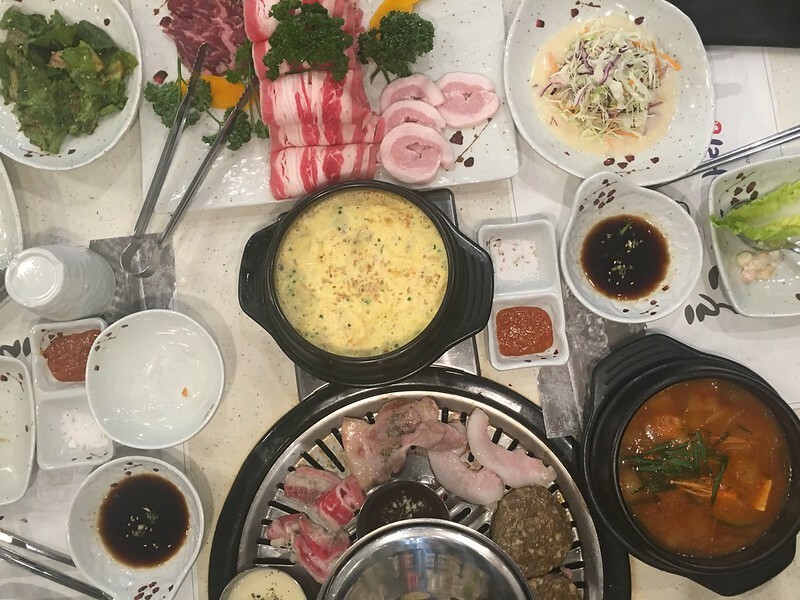 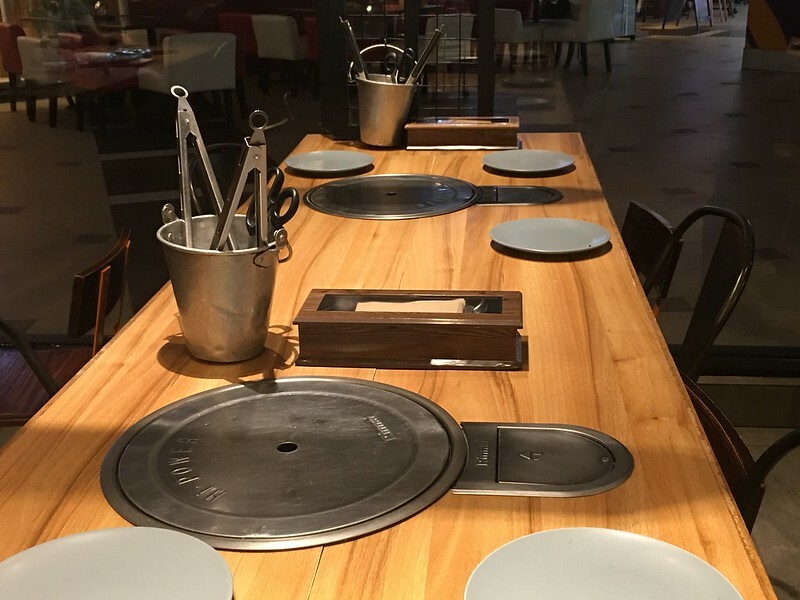 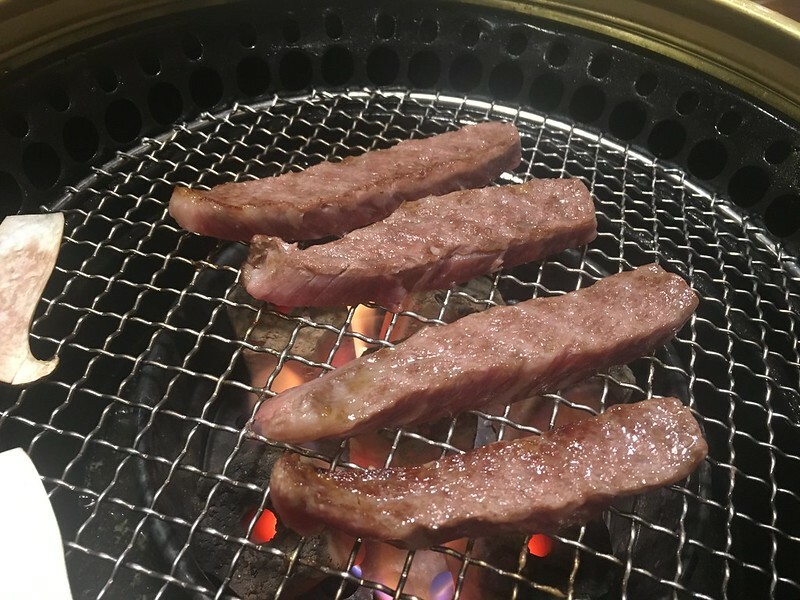 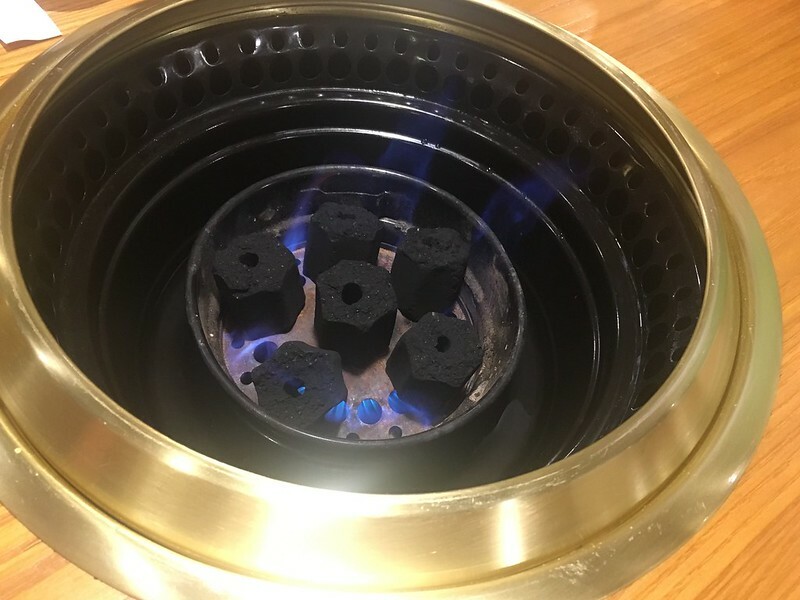 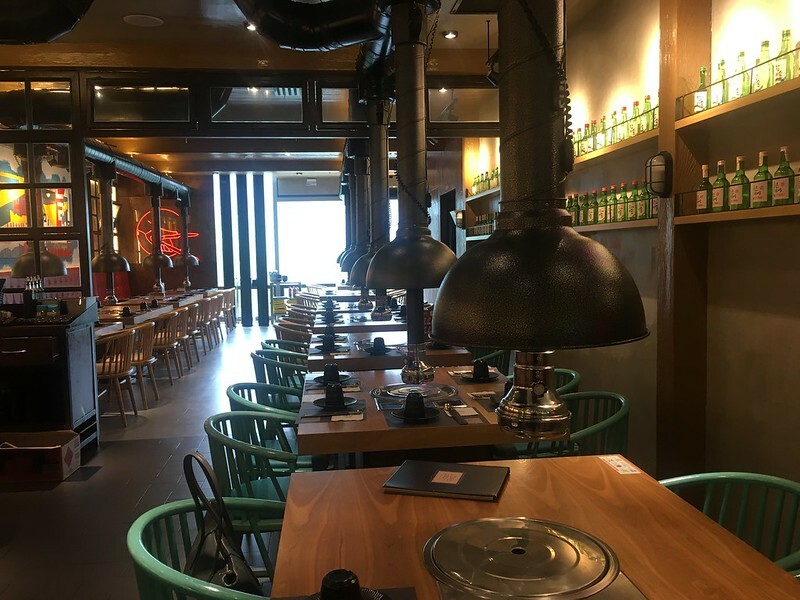 Each table is equipped with a state-of-the-art grilling stove, allowing diners to cook their meats according to their preference. 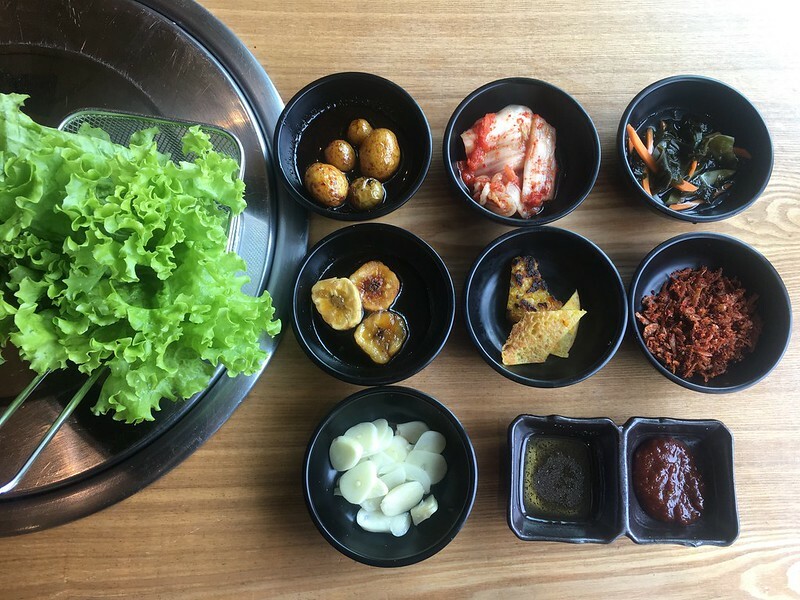 Upon assisting me to my window seat, my server Macq immediately laid out side dishes for me to munch on while I wait. 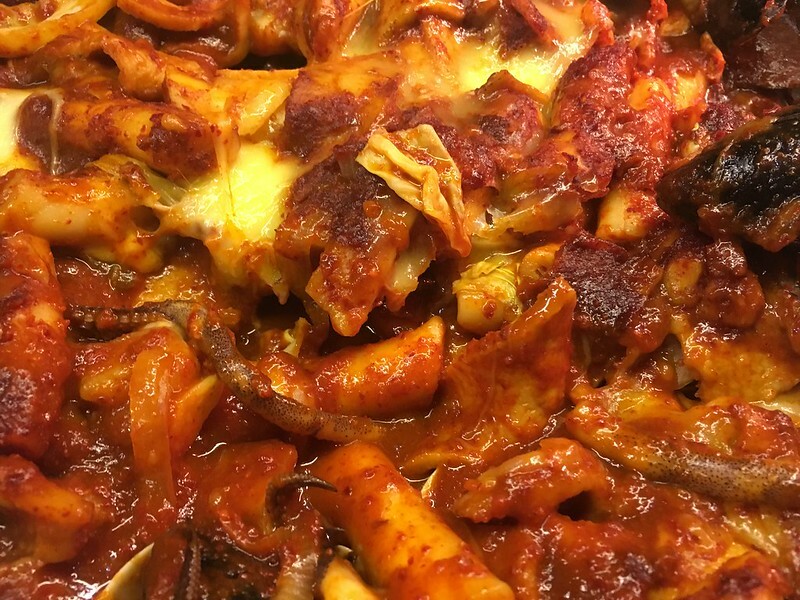 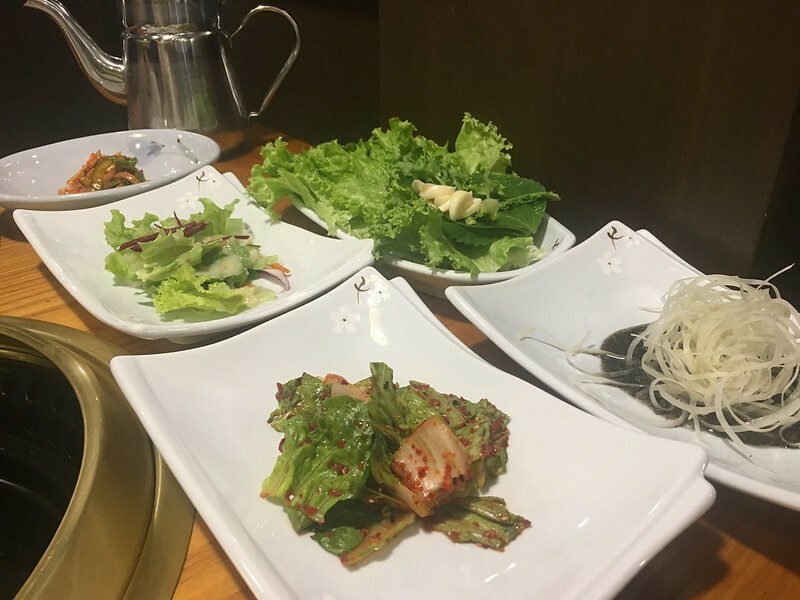 These include kimchi (of course! 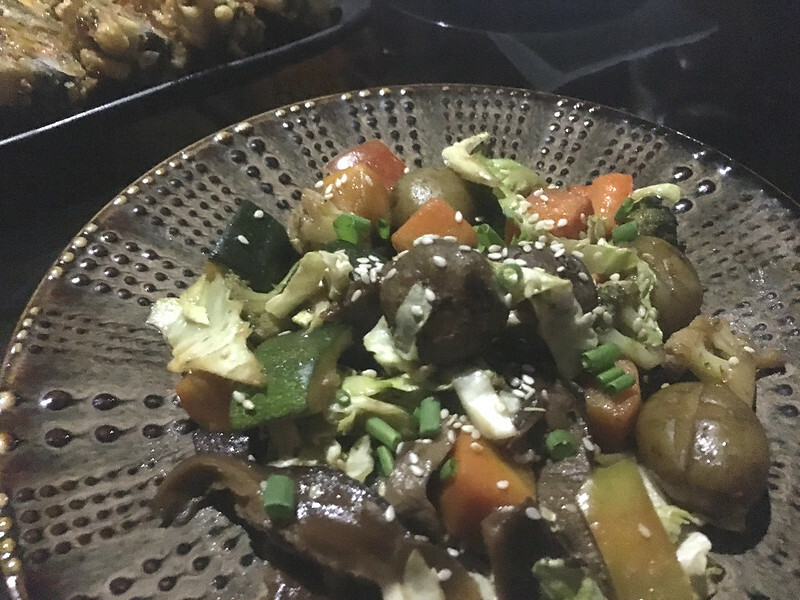 ), strips of flat scrambled egg, soy potatoes, crushed dilis, banana slices and assorted veggies. 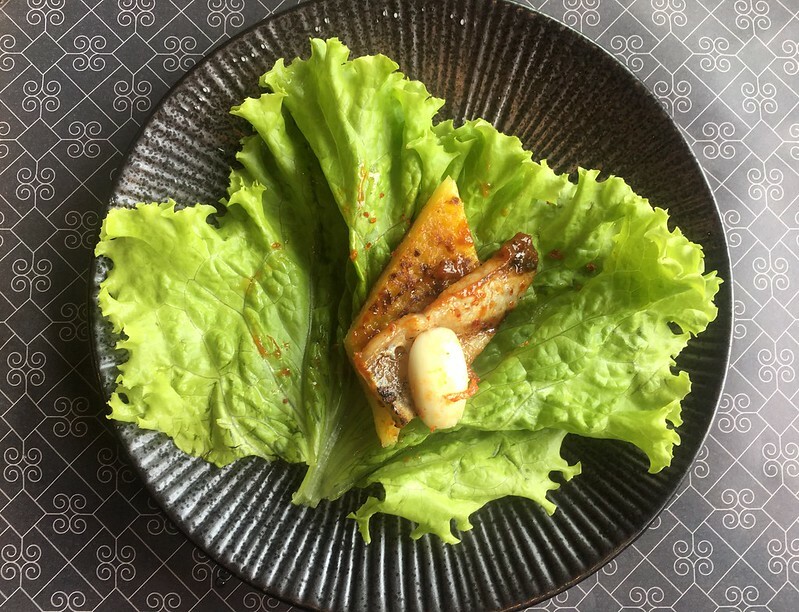 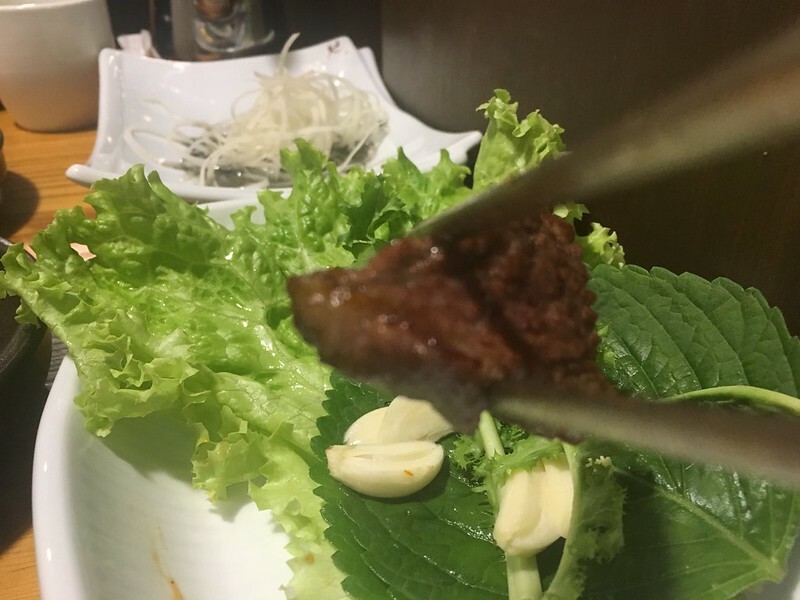 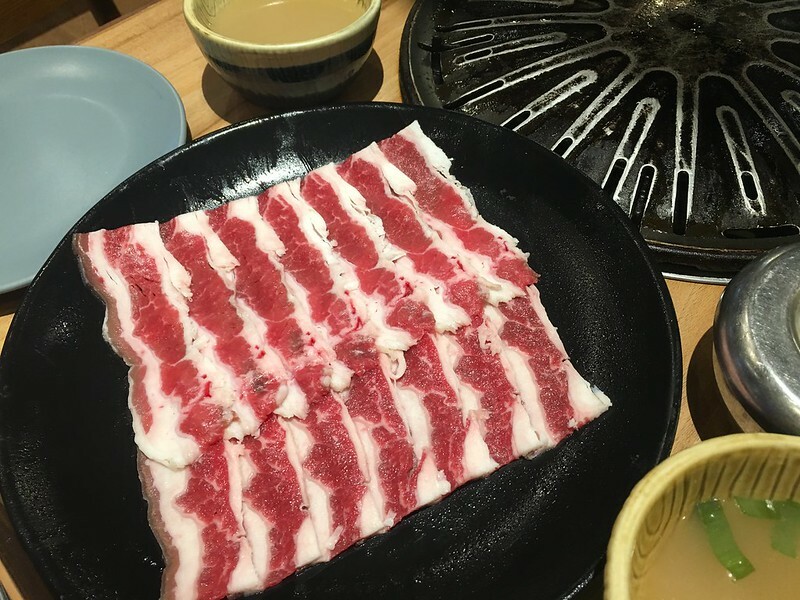 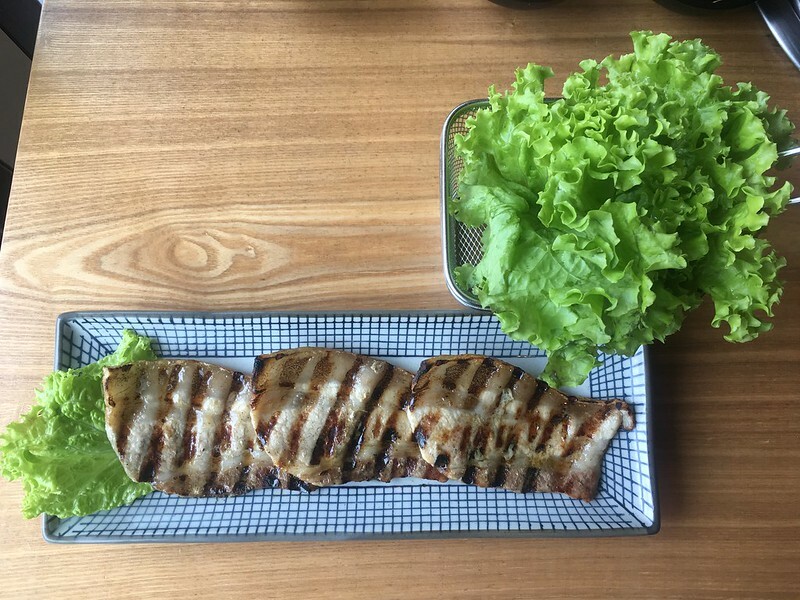 When Macq finished serving and slicing the grilled pork belly, I dipped tender and juicy slices in the ssamjang and sesame oil provided, then wrapped them in lettuce leaves together with thin slices of garlic and some of the crushed dilis. 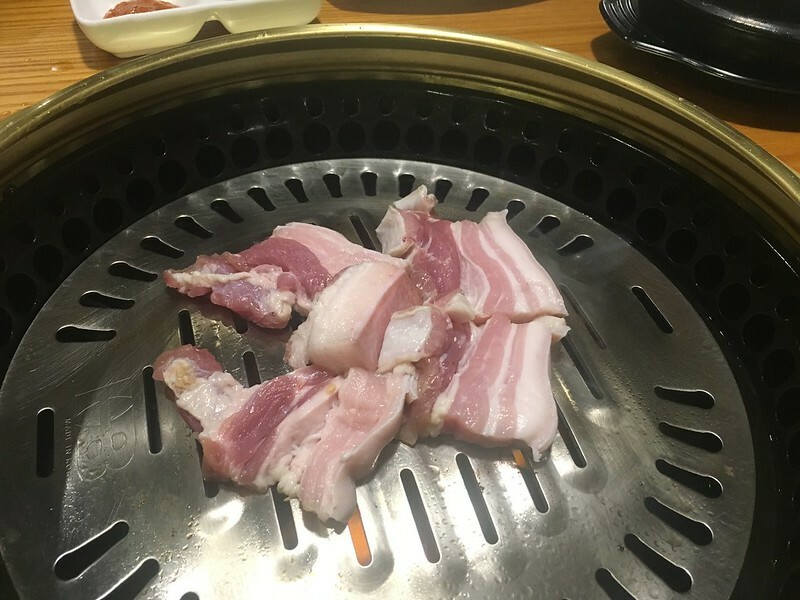 This resulted to a very tasty mouthful of samgyeopsal. 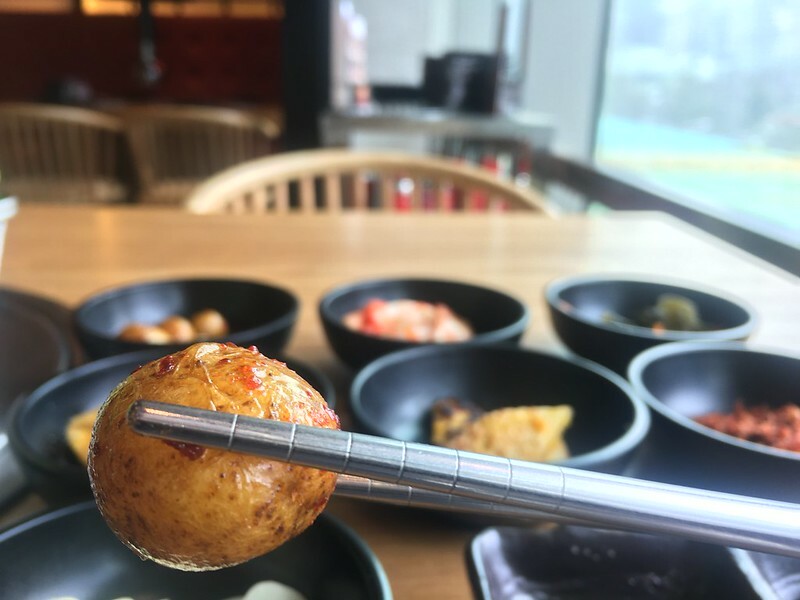 I took advantage of the unlimited side dishes by asking for refills of the potatoes, egg, and banana slices. 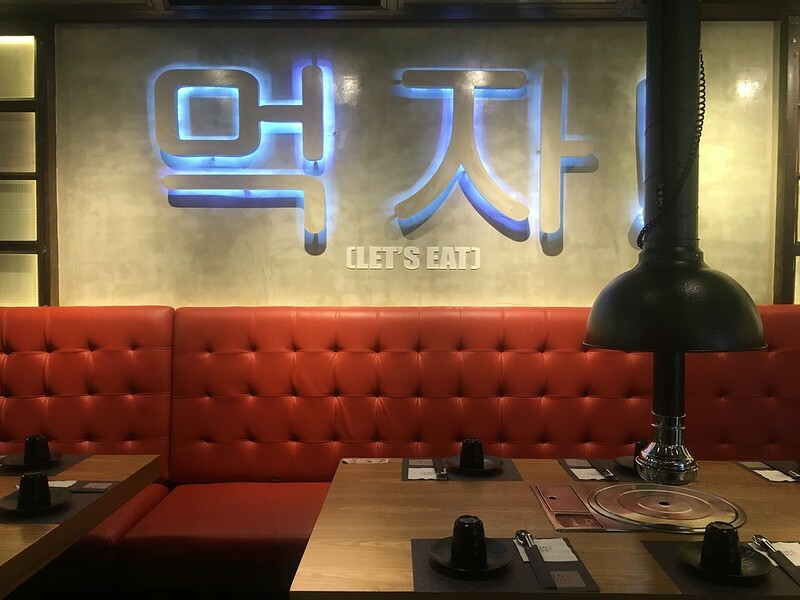 Call the branch first to reserve. 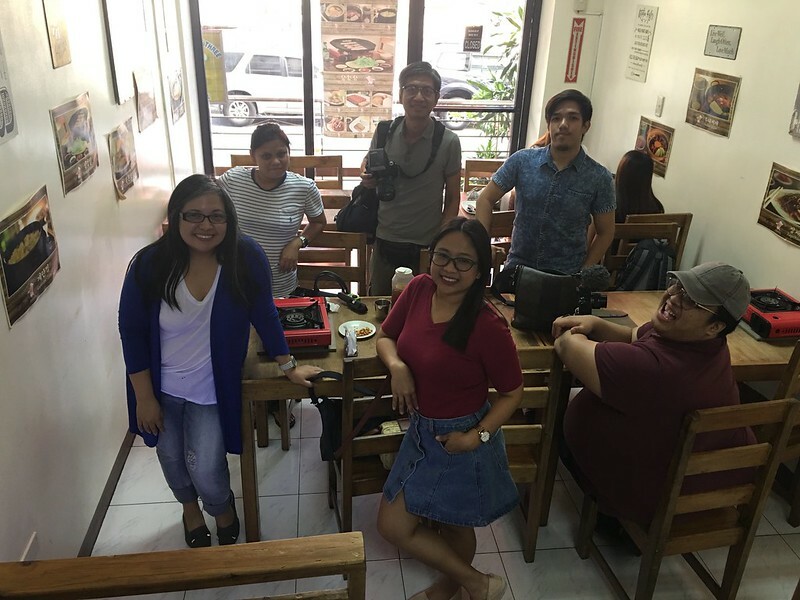 Walk-ins are usually not accommodated. 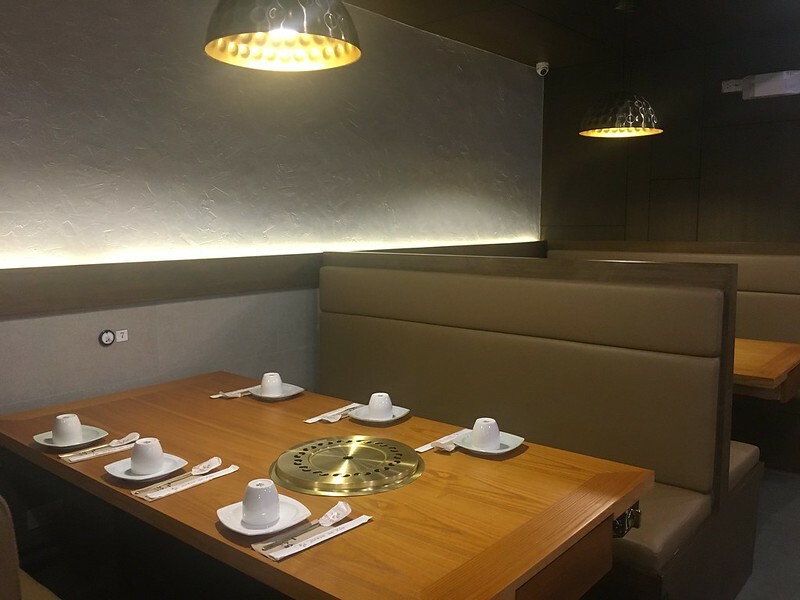 Arrive on time as your reservation will only be held for 20 minutes. 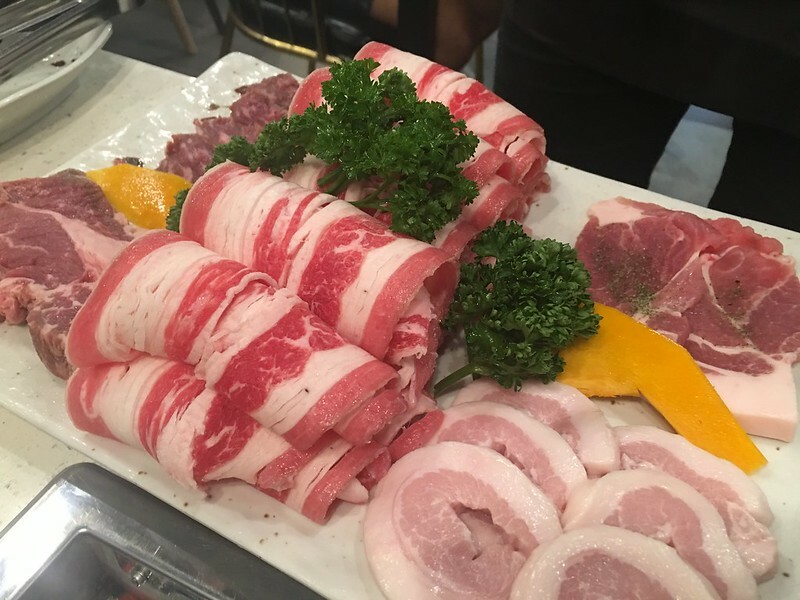 You can only use one Metrodeal voucher per visit. 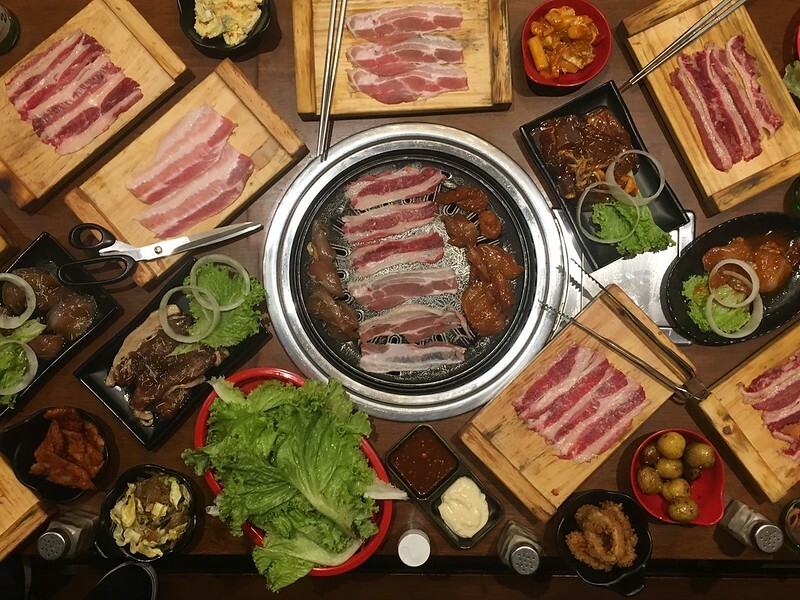 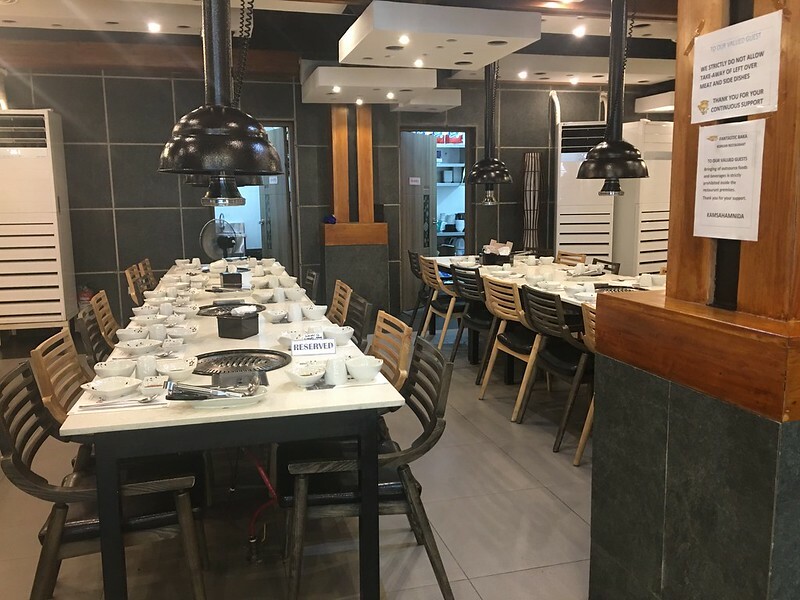 On my next visit, I’m looking forward to trying Jin Joo’s 10 Flavors Unli K-BBQ set priced at Php499/person (add Php50 for dinner). 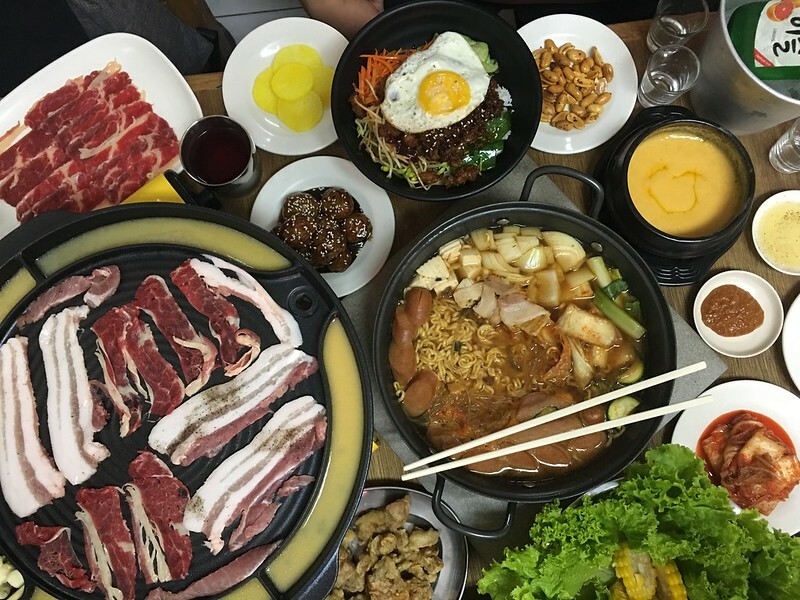 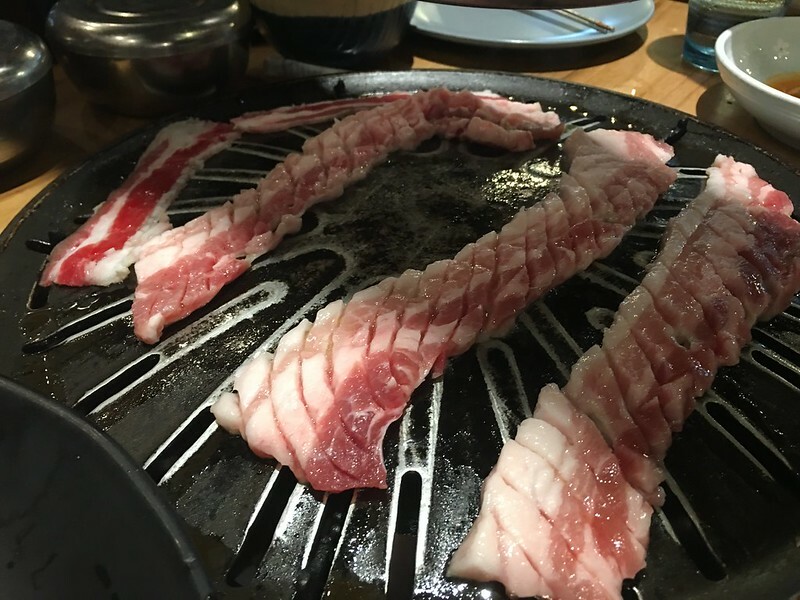 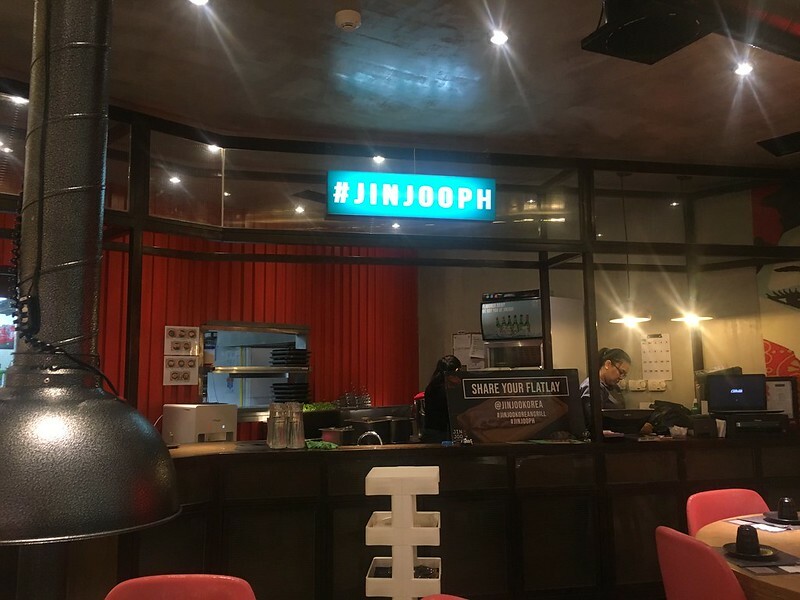 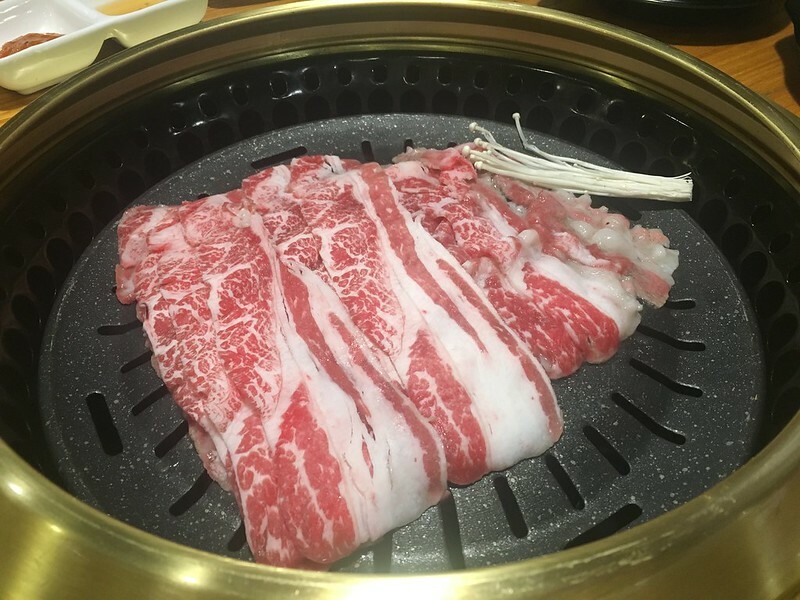 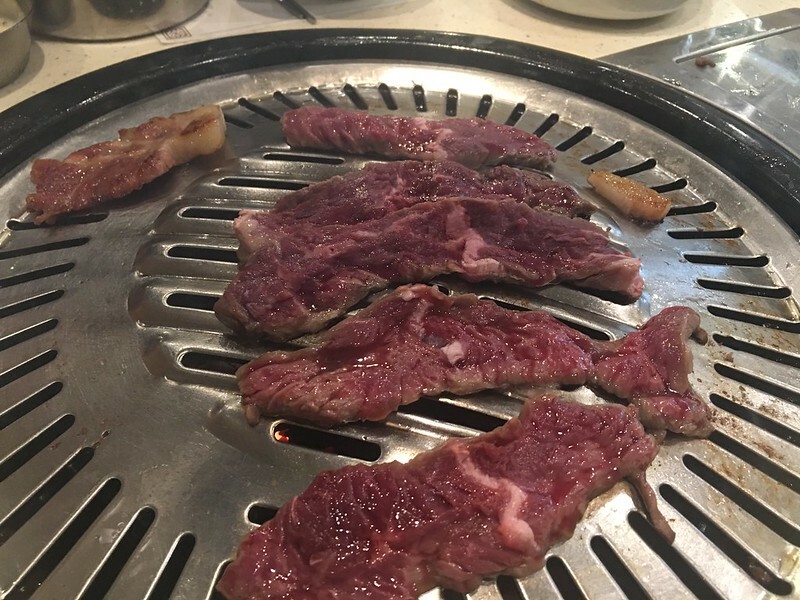 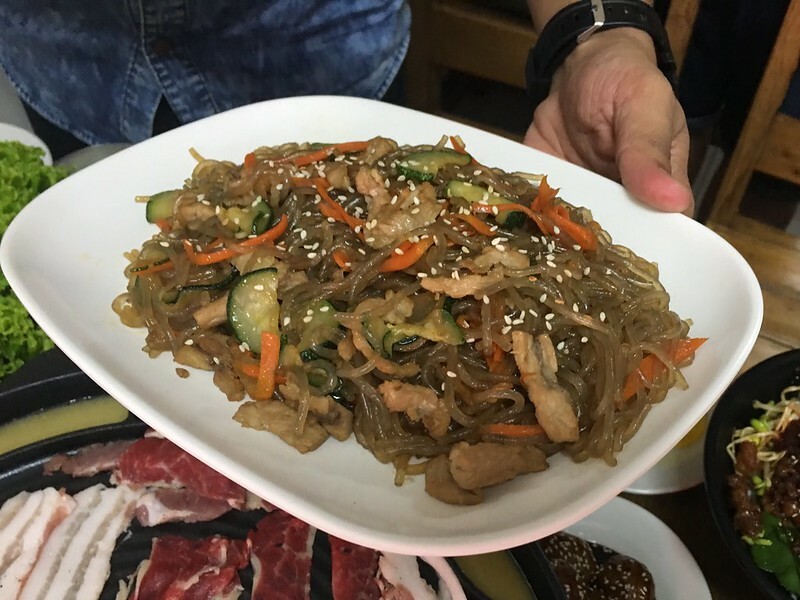 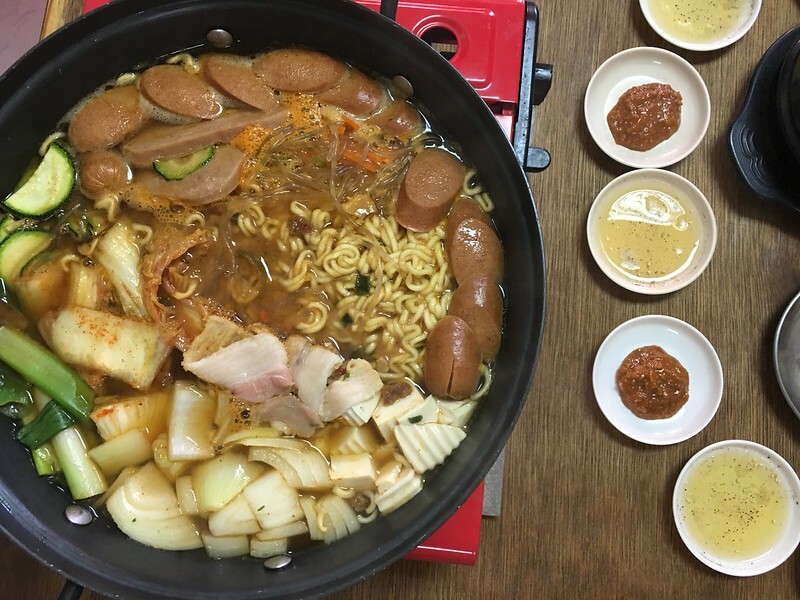 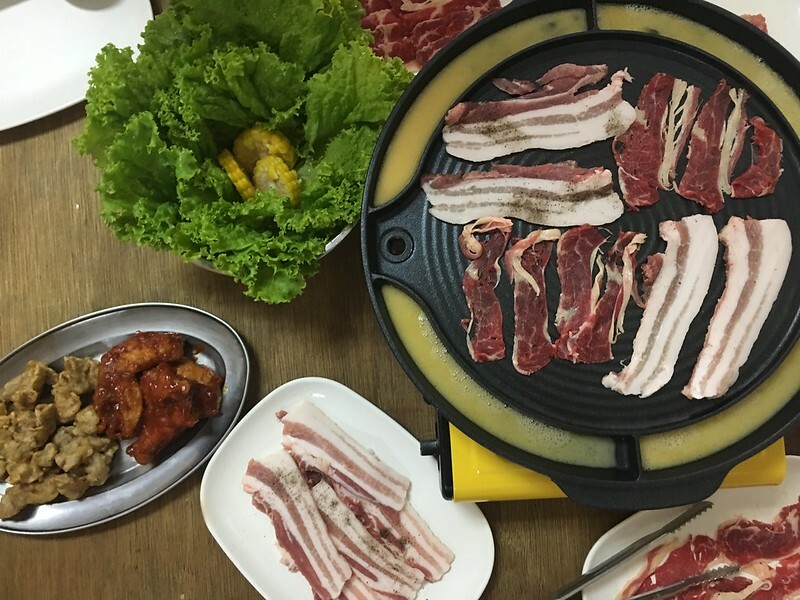 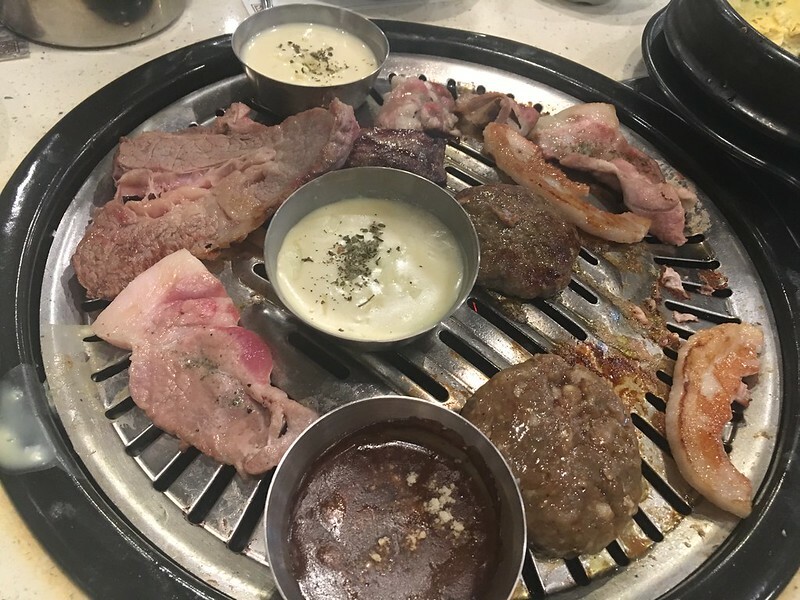 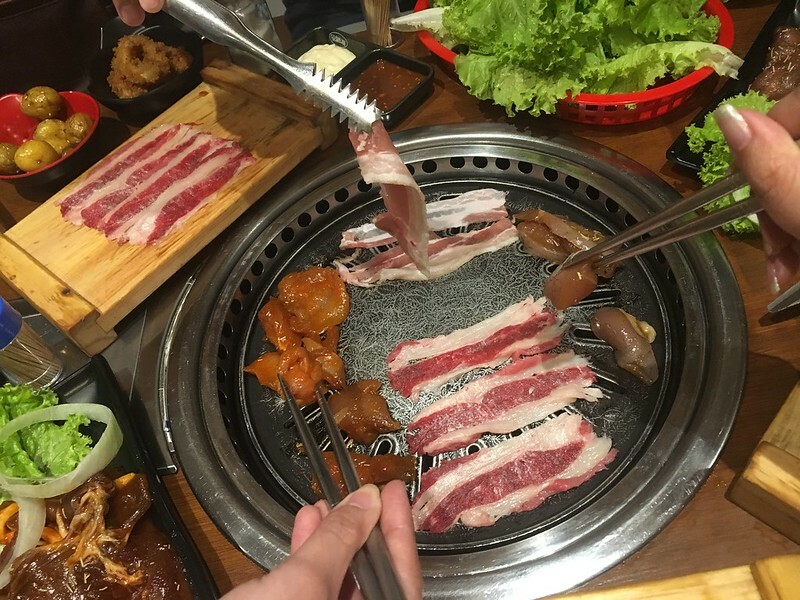 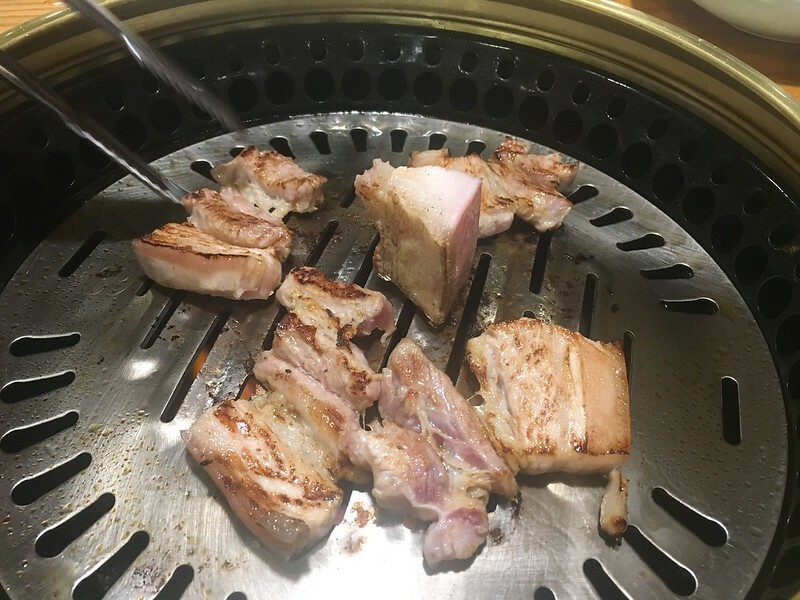 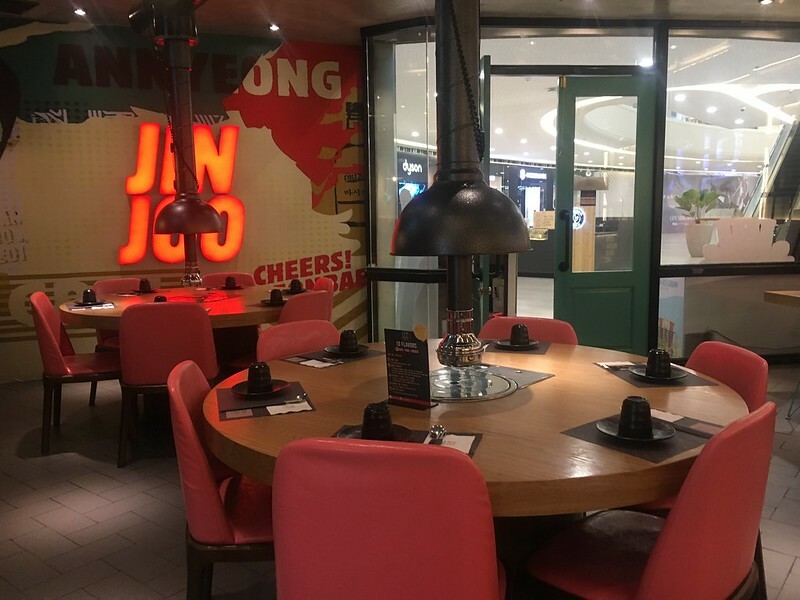 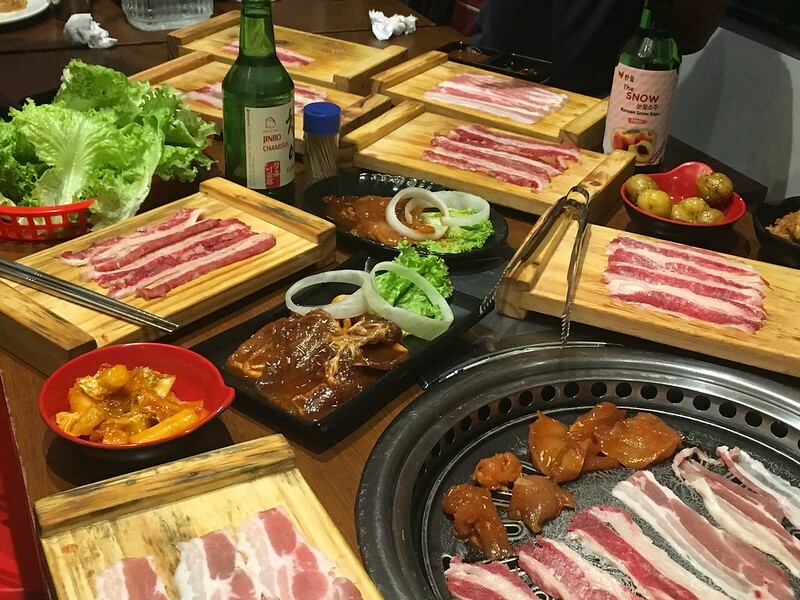 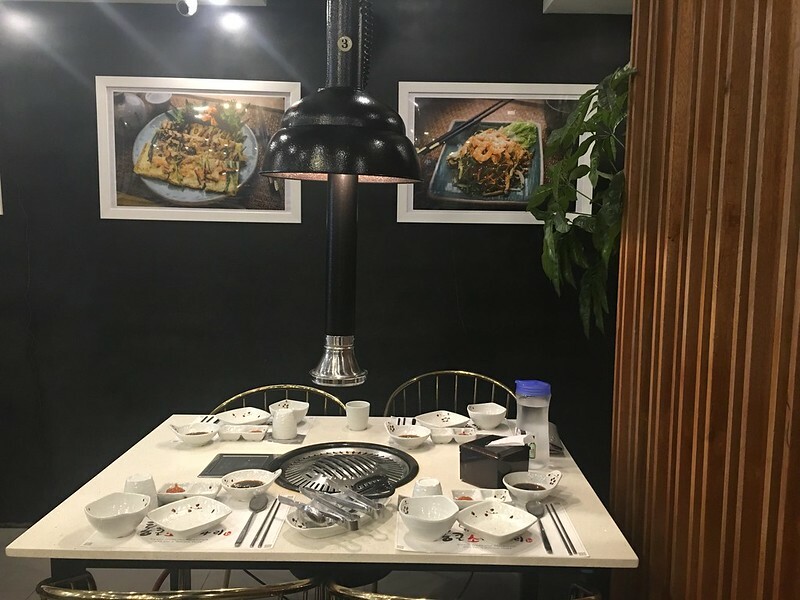 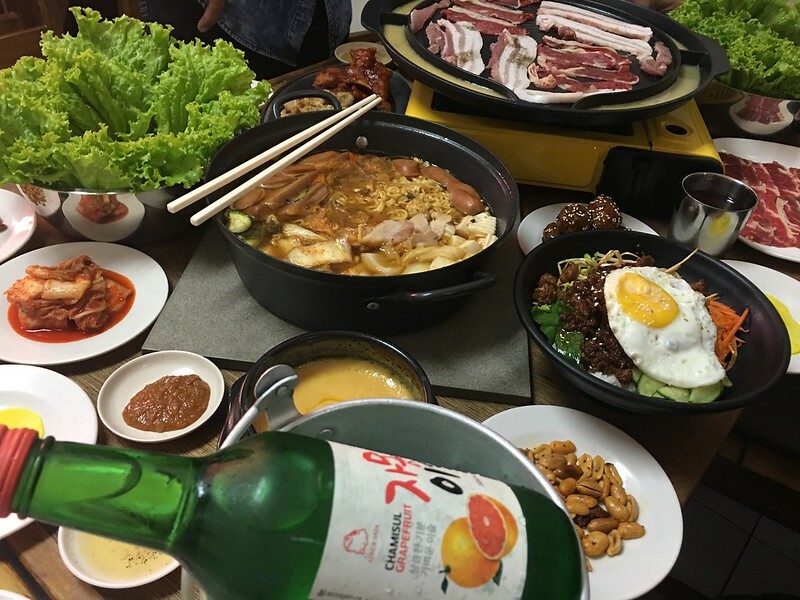 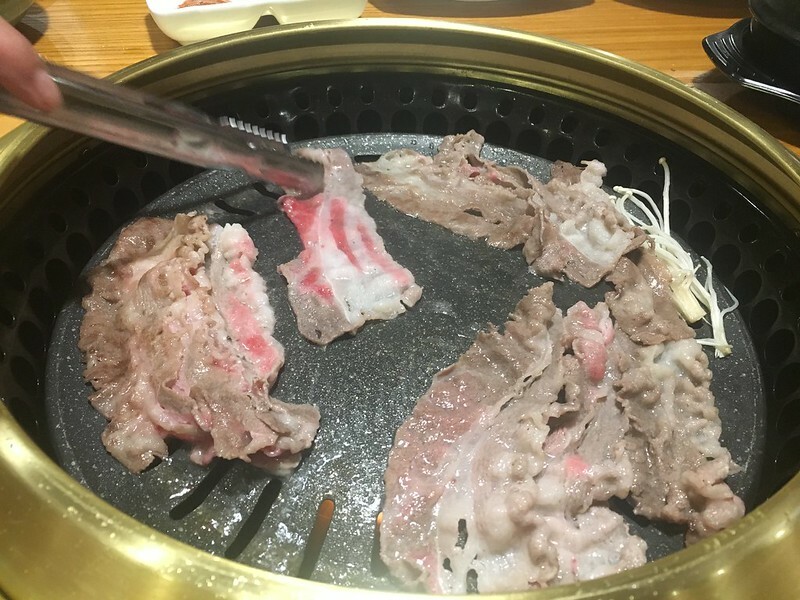 This Jin Joo Korean Grill branch is located at the Second Floor, The Podium, ADB Avenue, Ortigas, Mandaluyong City, open Mondays to Thursdays from 11am to 10pm and Fridays to Sundays from 10am to 10pm. 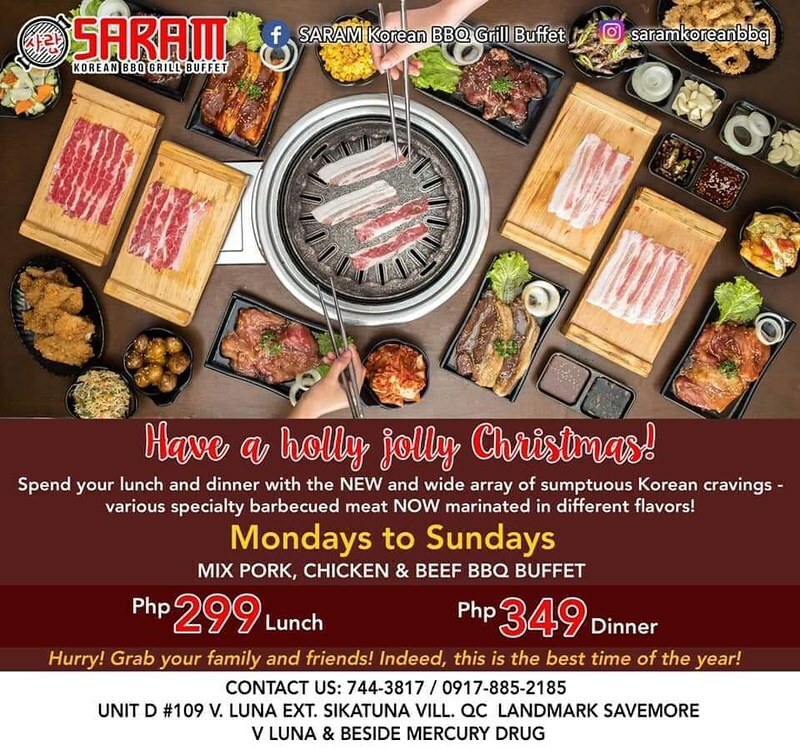 For queries and reservations, call +63 917 2555508. 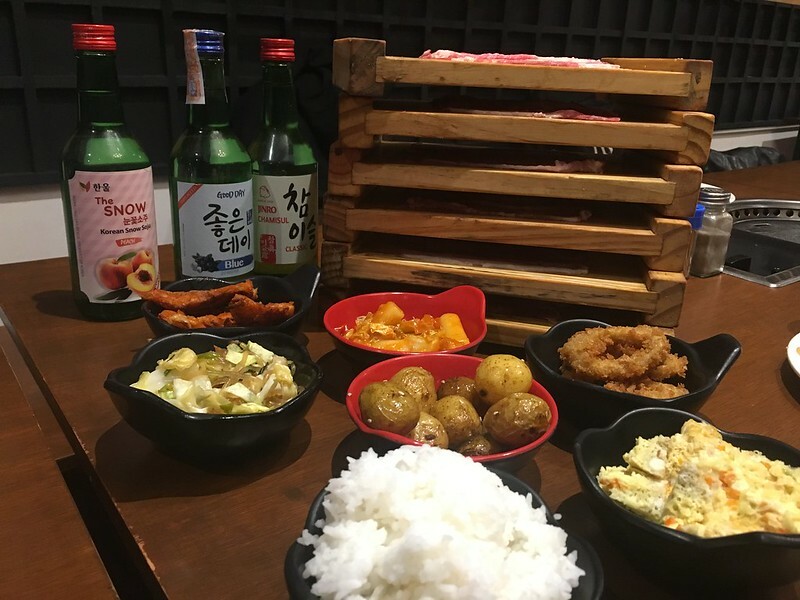 For more details, check out Jin Joo Korean Grill on Facebook and Instagram.